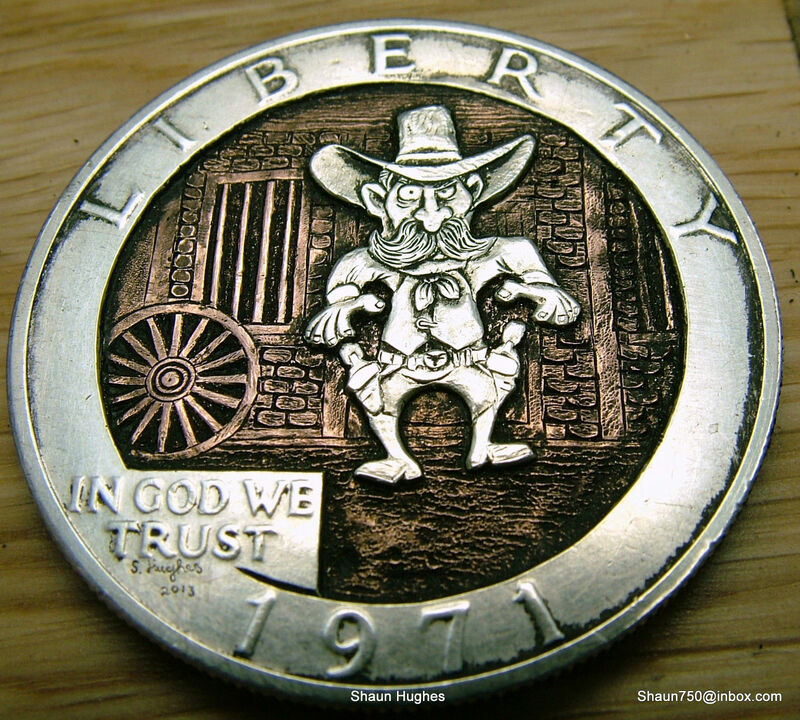 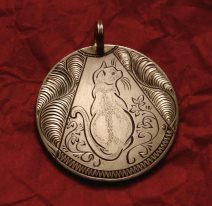 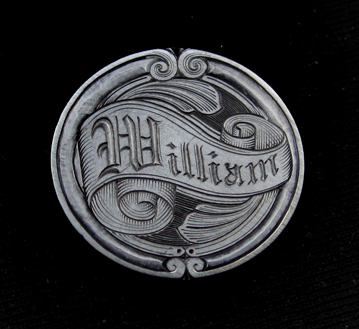 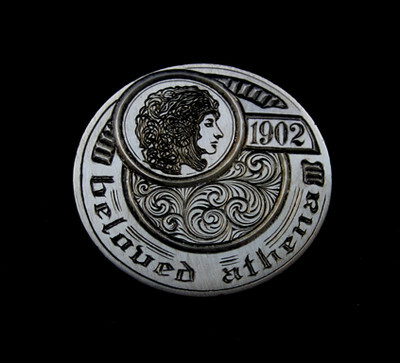 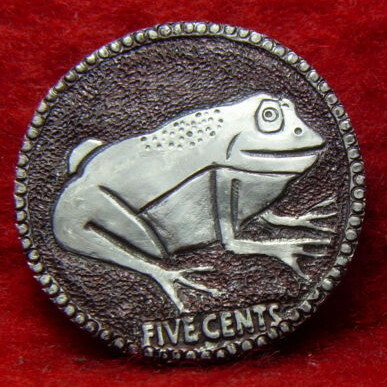 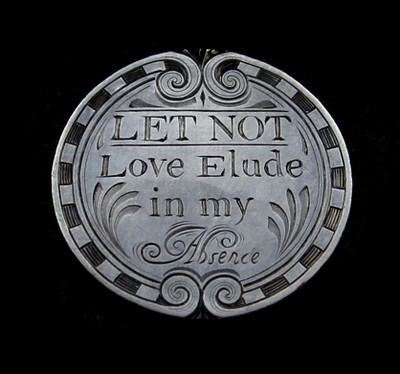 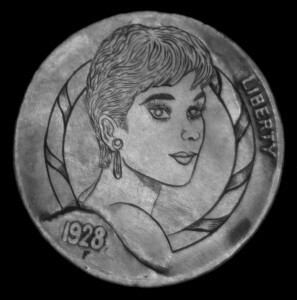 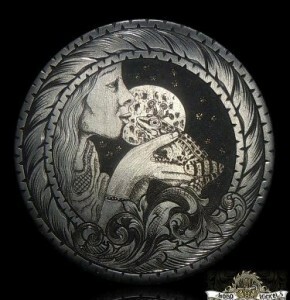 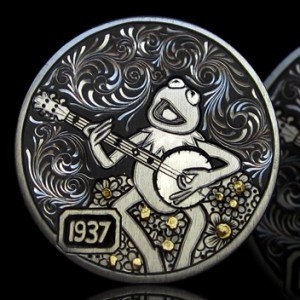 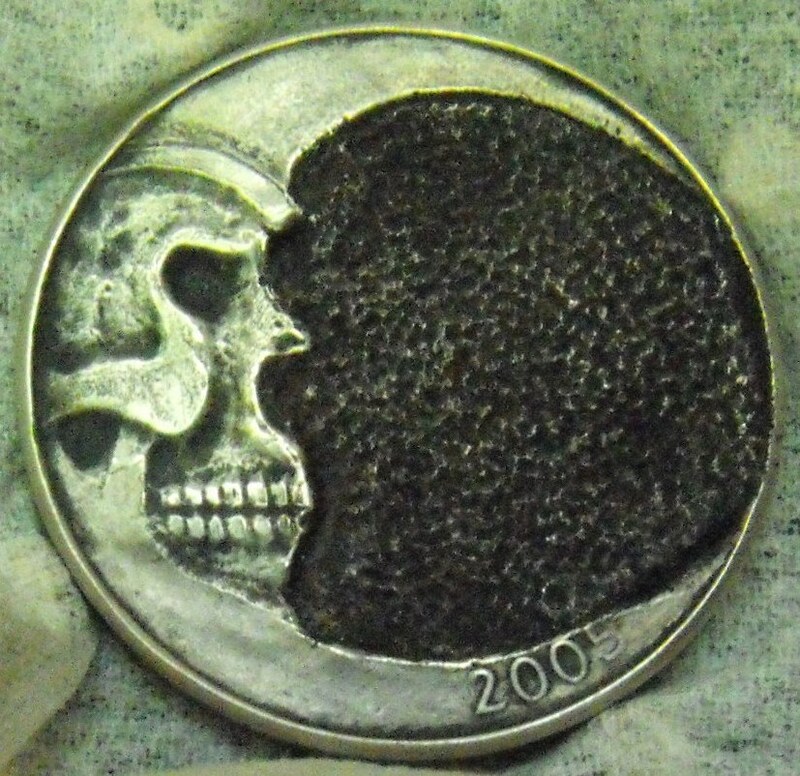 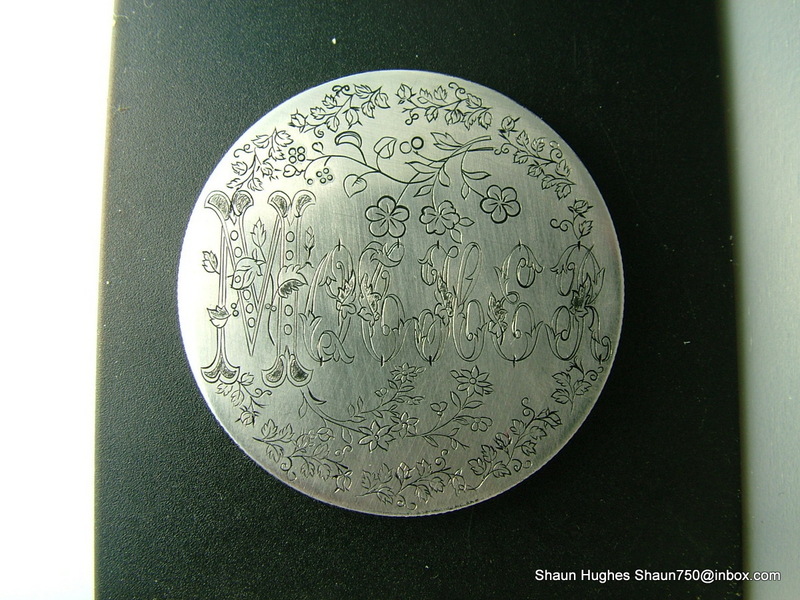 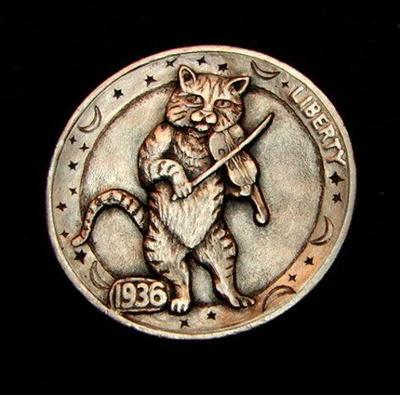 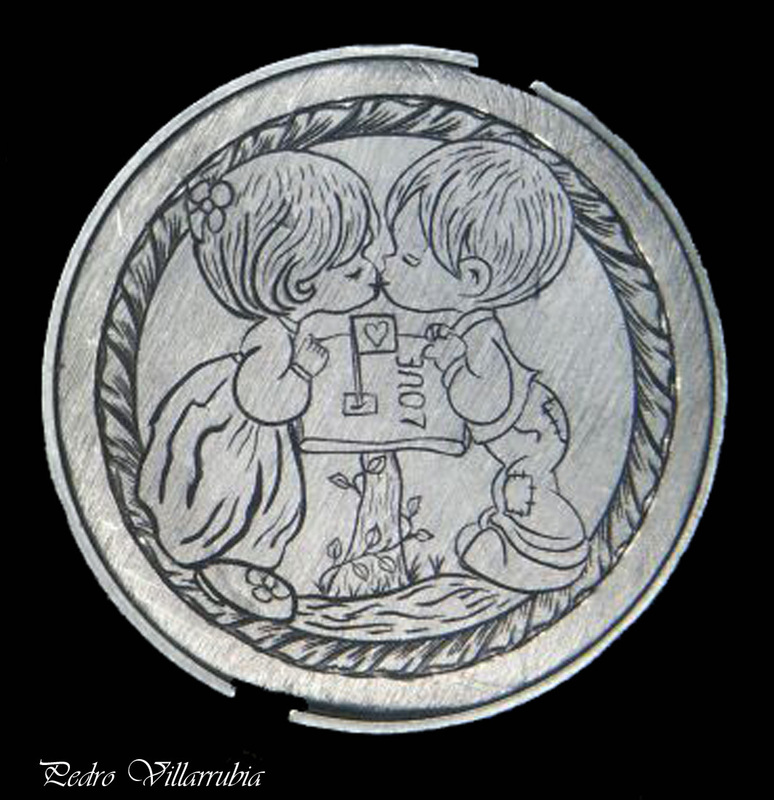 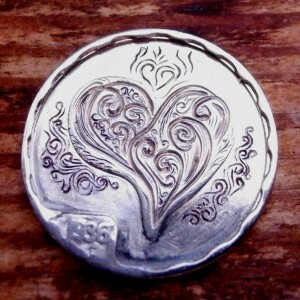 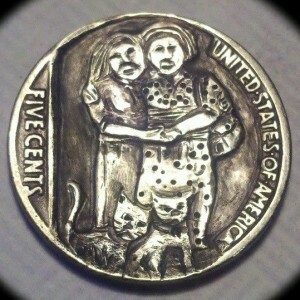 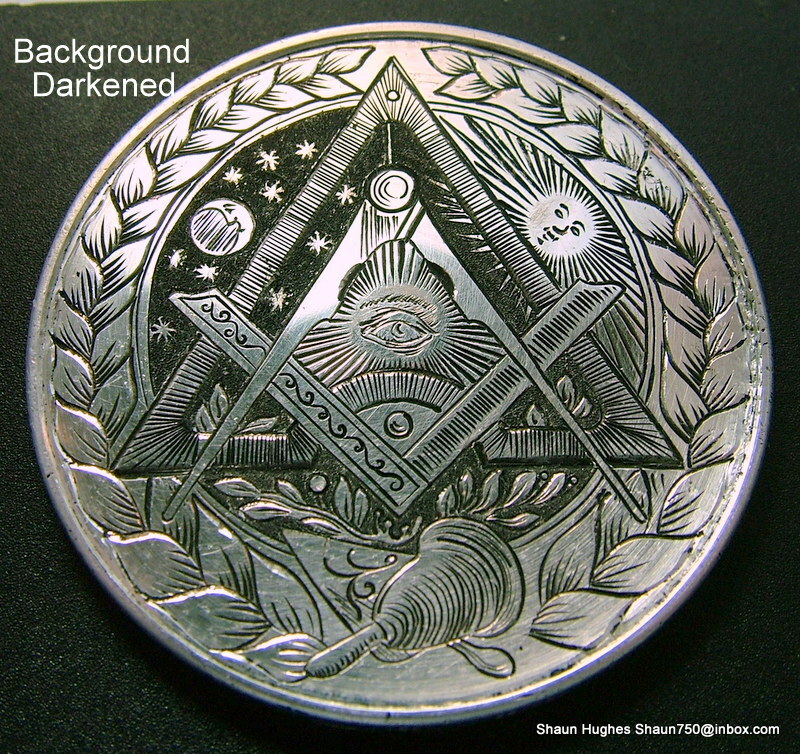 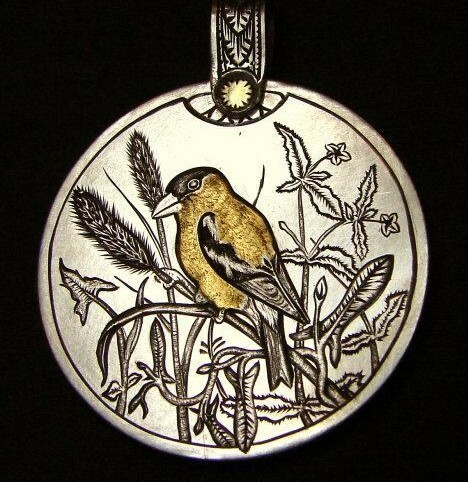 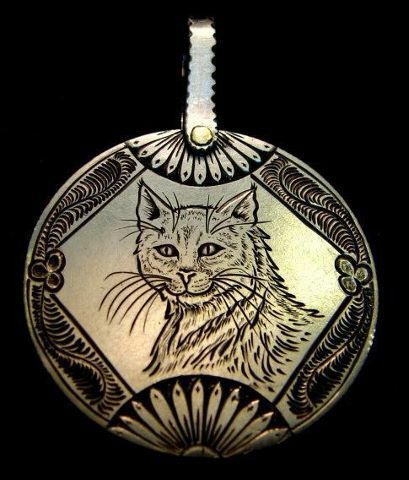 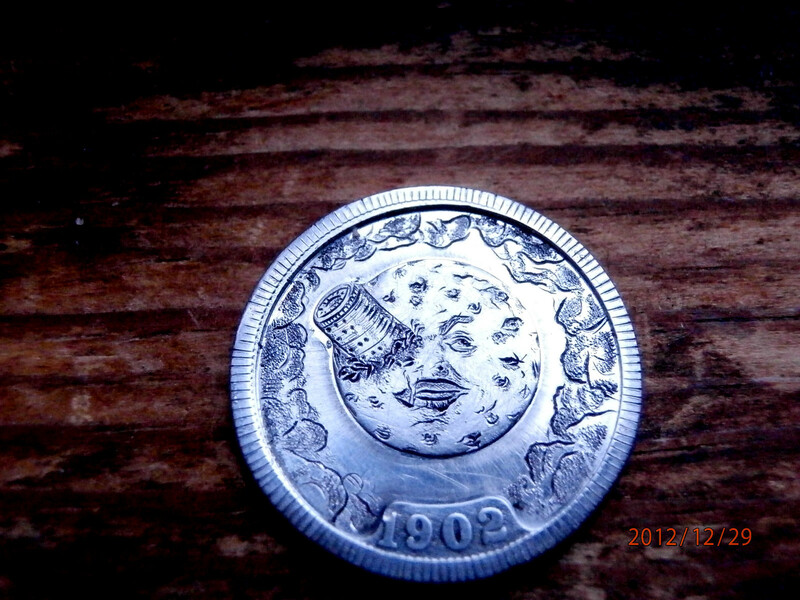 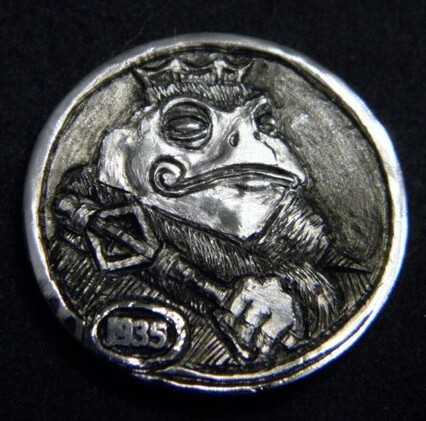 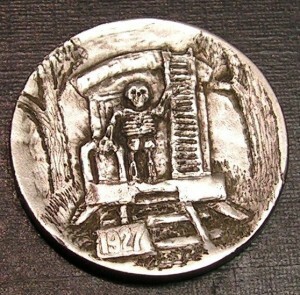 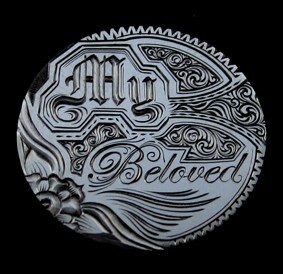 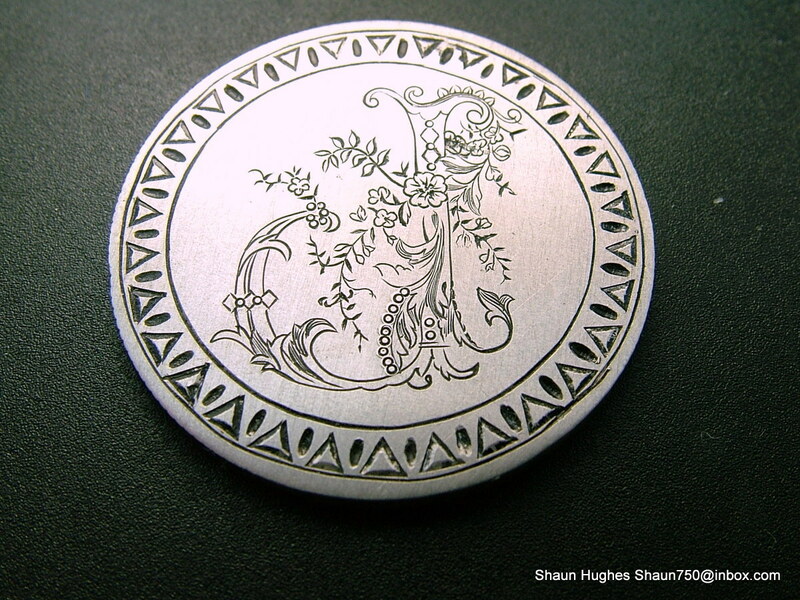 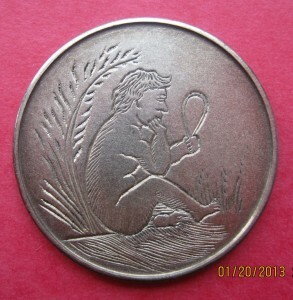 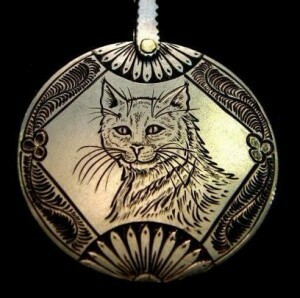 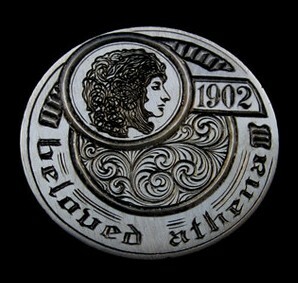 Carvetoon was not your typical hobo nickel artist, the engravings more resembled love tokens. 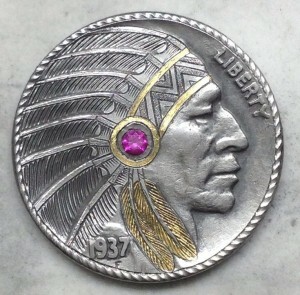 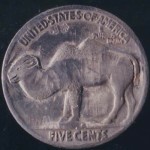 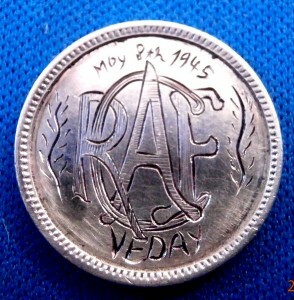 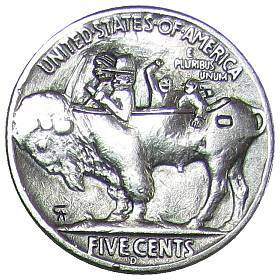 They were made from low grade Liberty nickels and Indian cents as well as a selection of foreign coins. 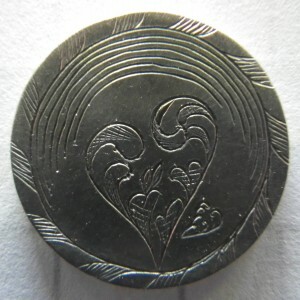 The coins were smoothed down but fine parallel lines were left etched in the coin’s surface. 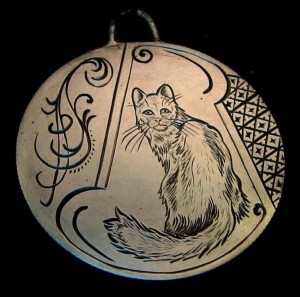 This is one diagnostic for this artist. 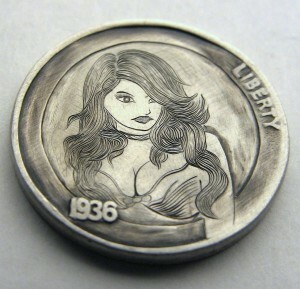 The other is the subject mater, the art was cartoon like. 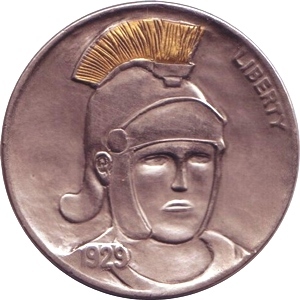 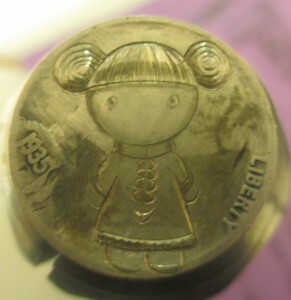 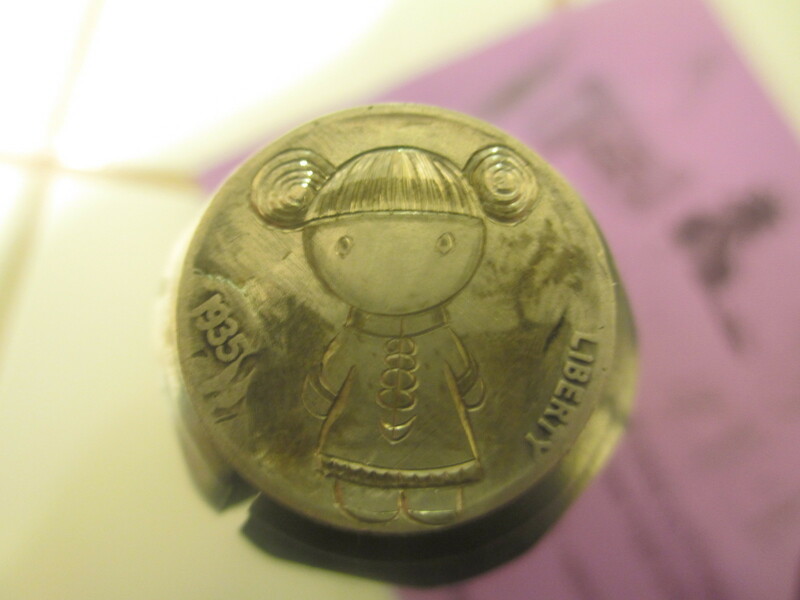 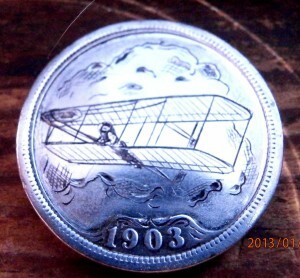 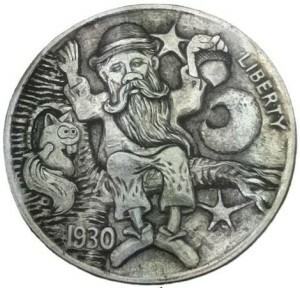 Both popular comic strip characters and animals made their way onto the coins. 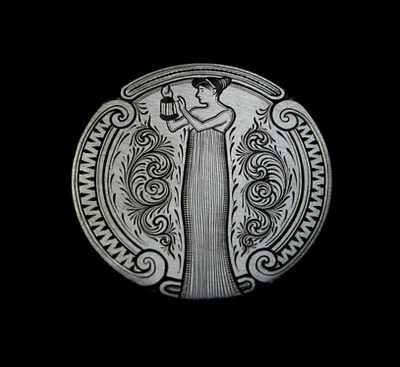 The images can best be described as designs resembling coloring book linear drawings. 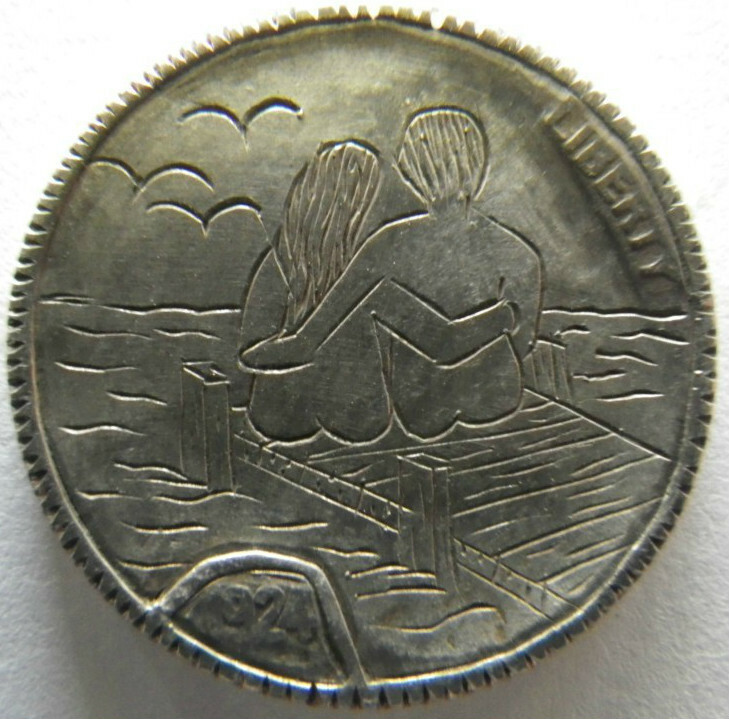 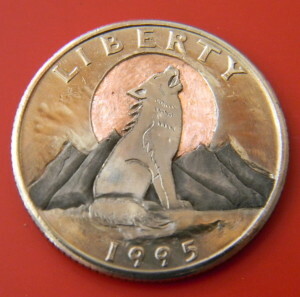 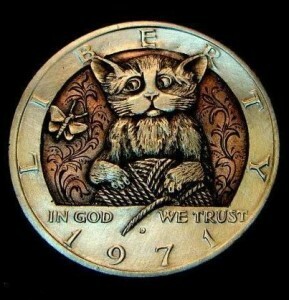 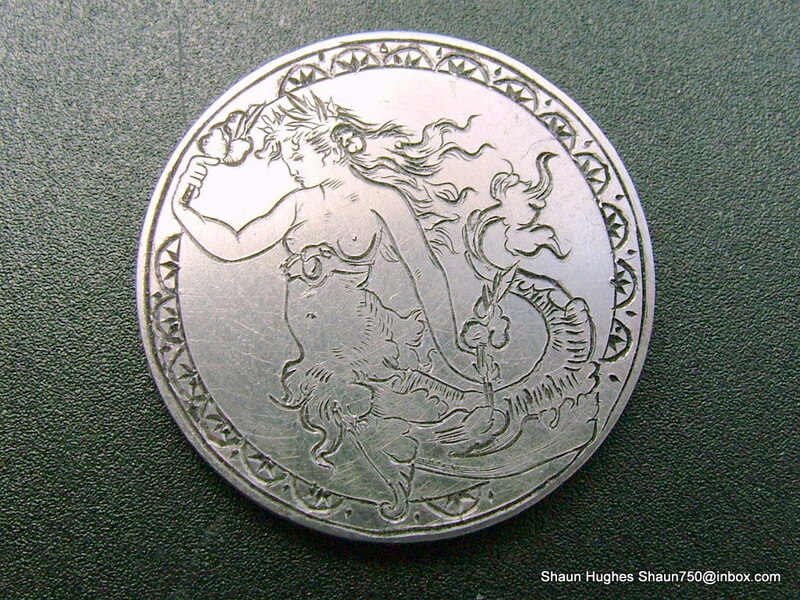 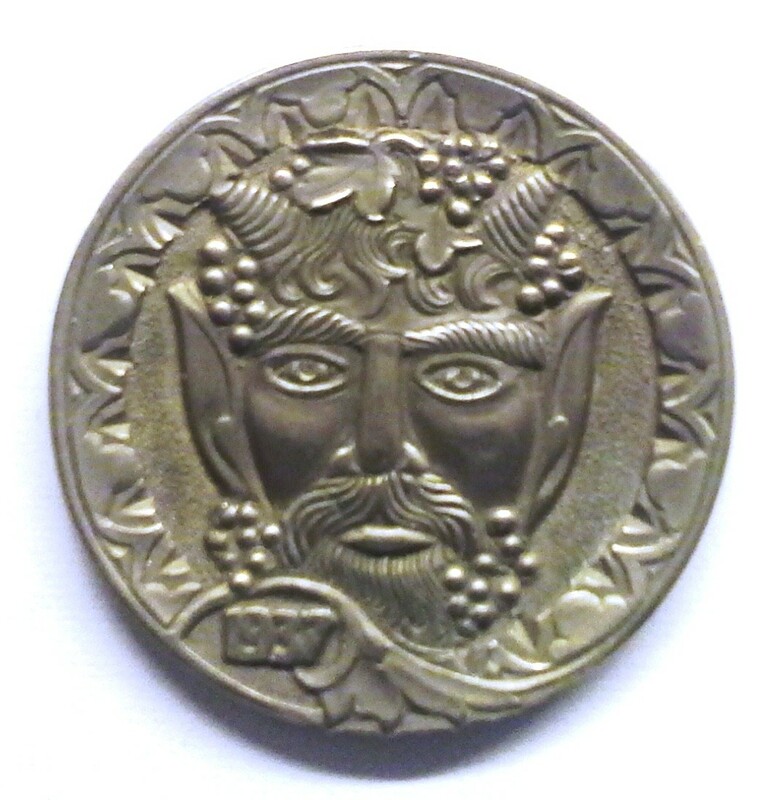 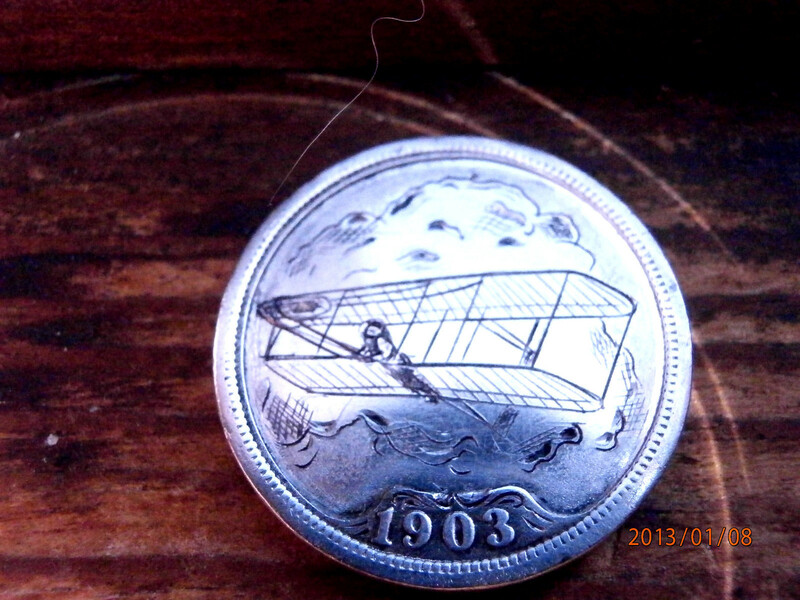 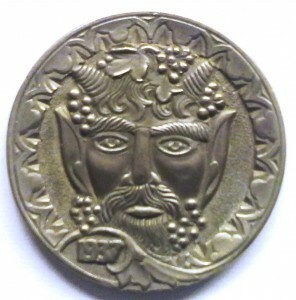 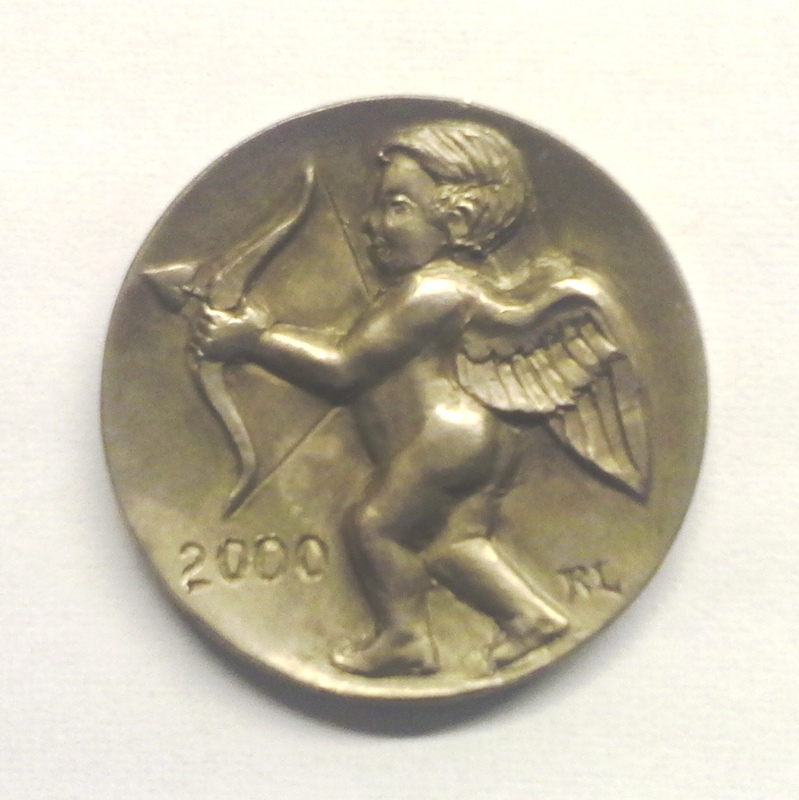 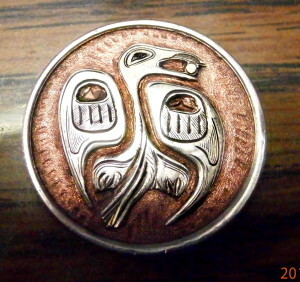 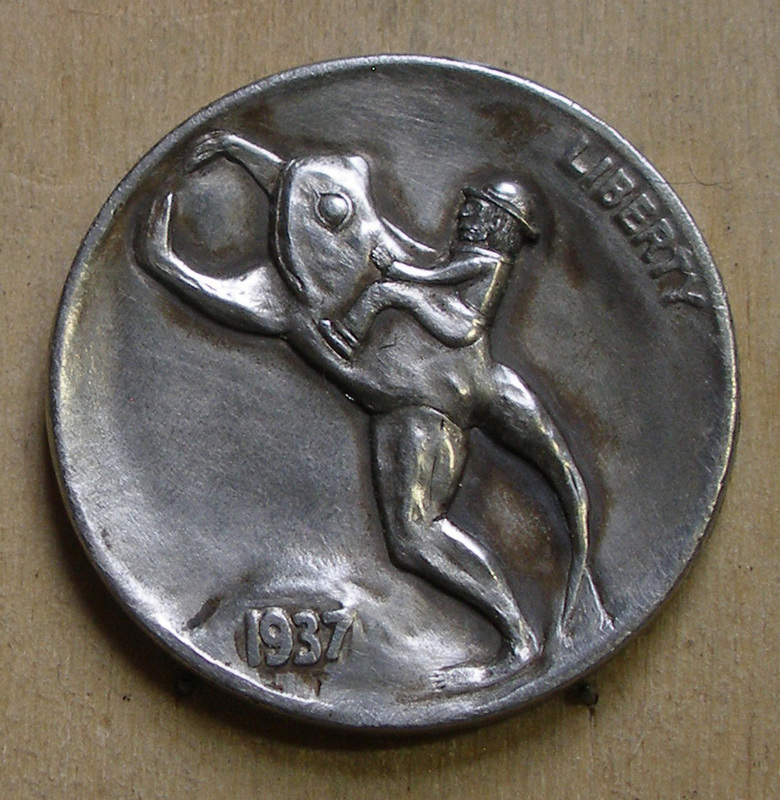 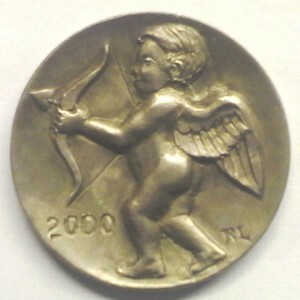 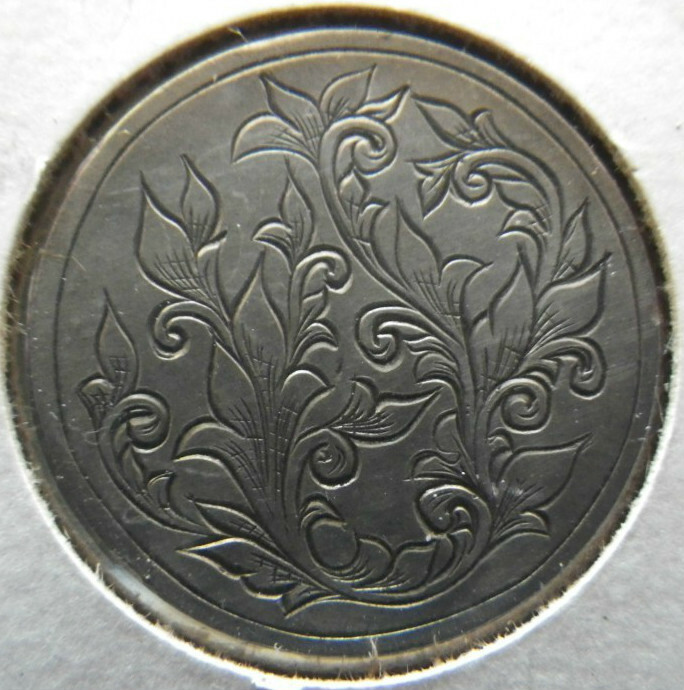 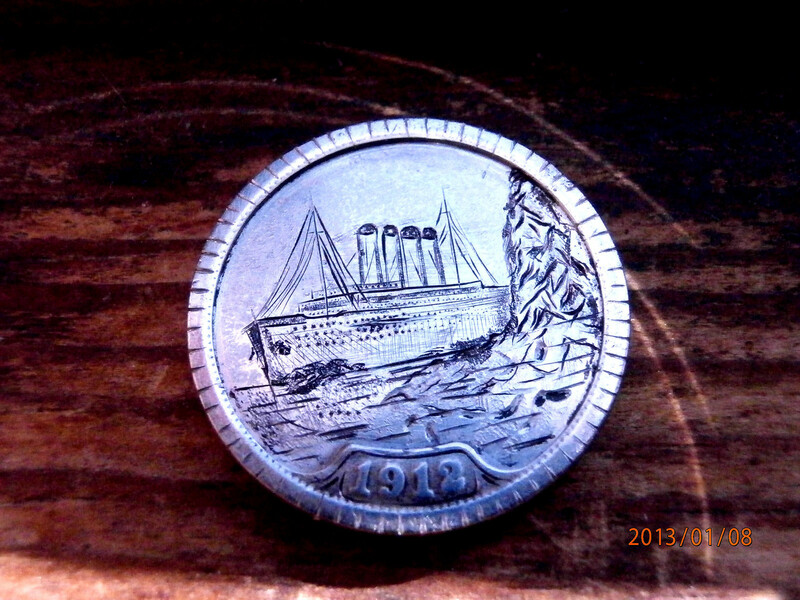 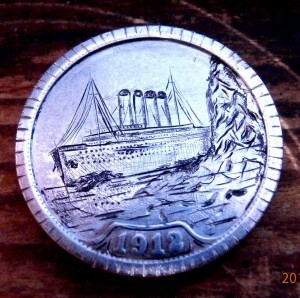 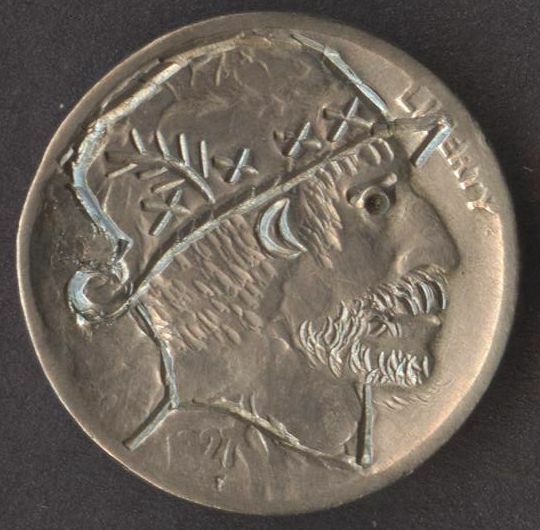 The coin art of the 1980’s was made for profit and the carvings were done rather speedily. One person later joined this Renaissance movement and turned hobo nickels into a fine art. 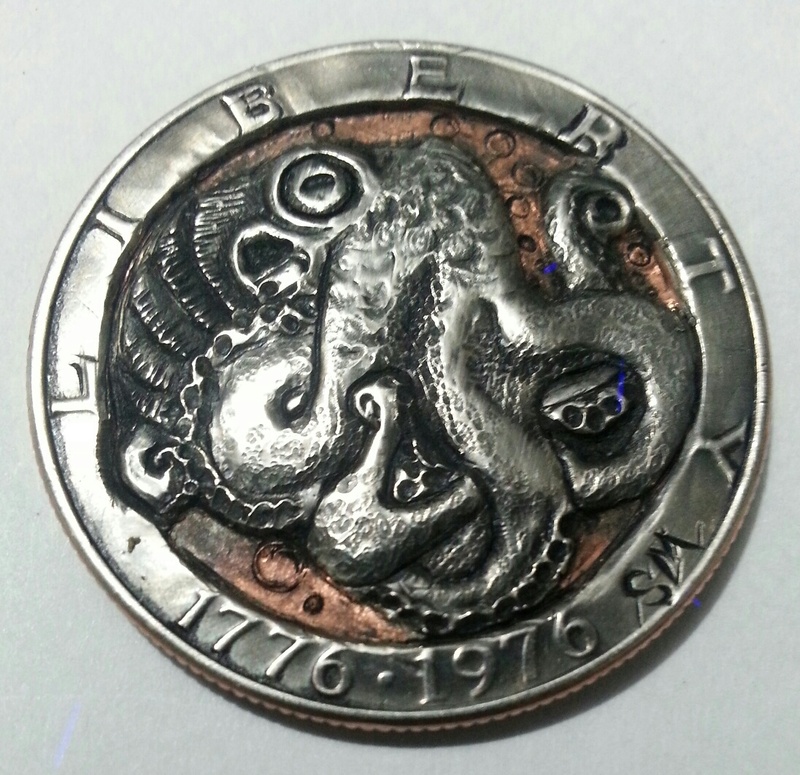 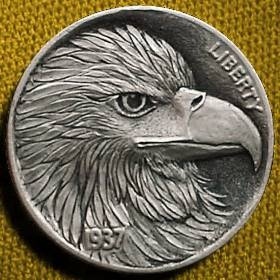 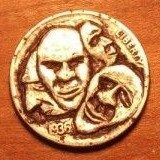 Ron Landis was a die engraver and opened the Gallery Mint. 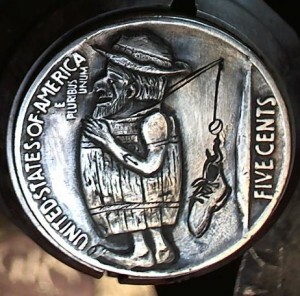 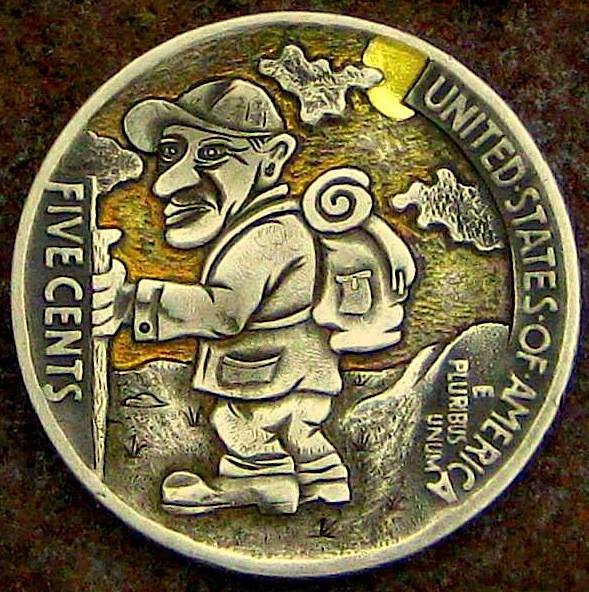 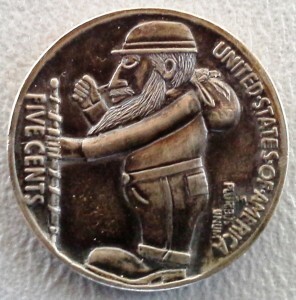 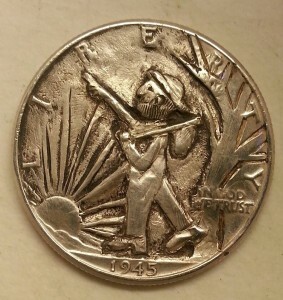 As a hobby in his spare time he carved hobo nickels. 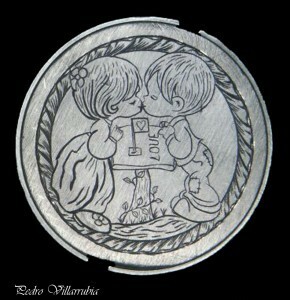 They were painstakingly detailed and not for sale. 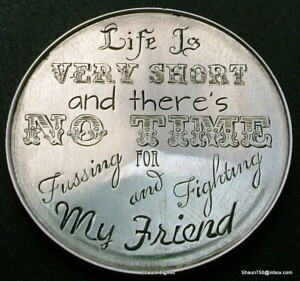 Occasionally a good friend was given one but they were not sold. 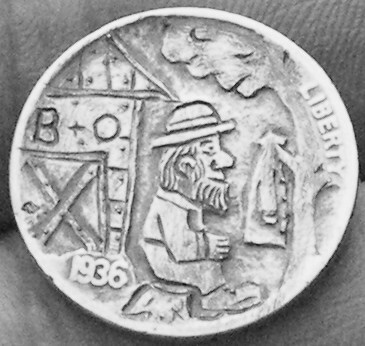 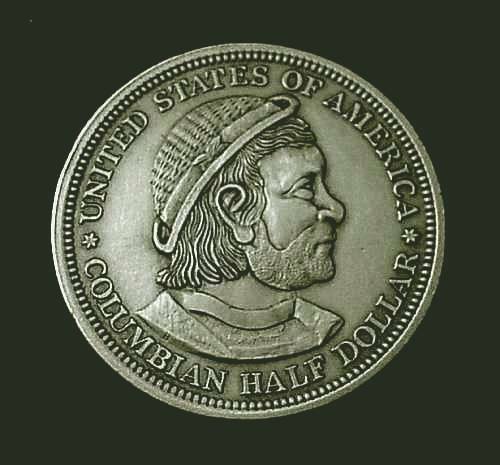 Later in the late 1990’s a few came on the market at auction and set record prices, thus creating a new marketplace for laboriously carved and expertly made hobo nickels. 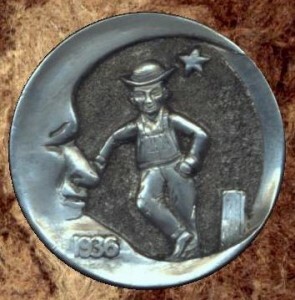 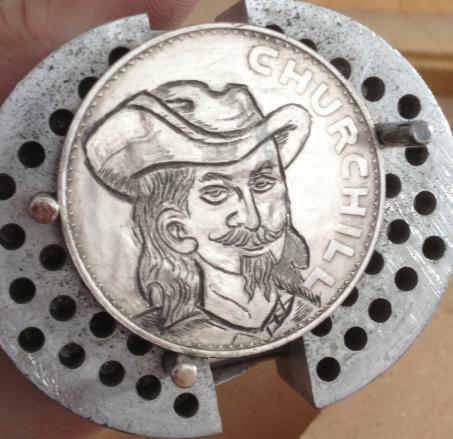 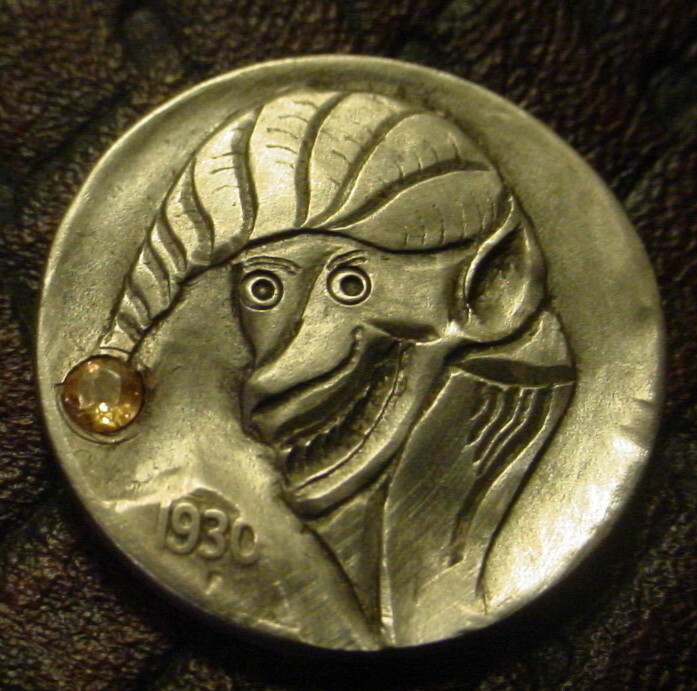 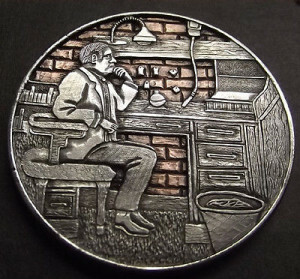 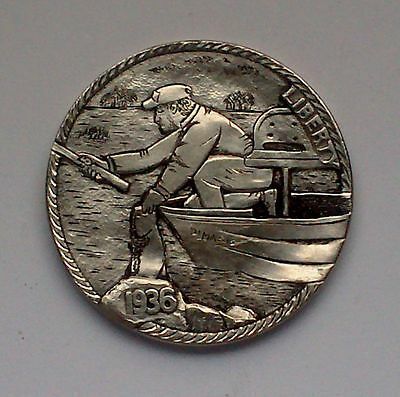 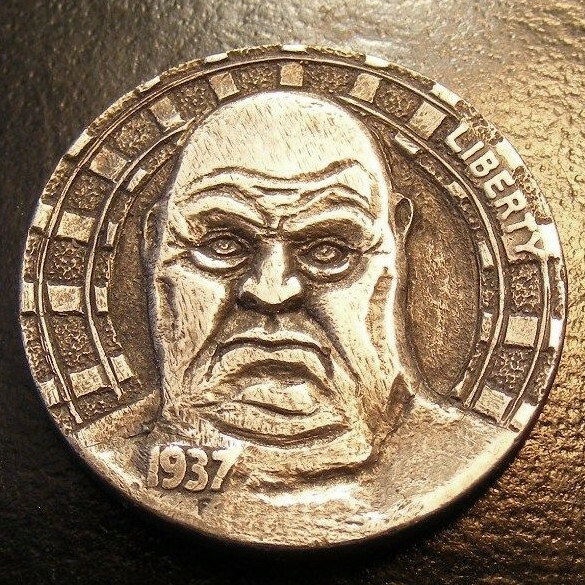 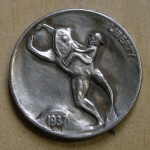 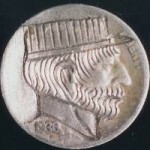 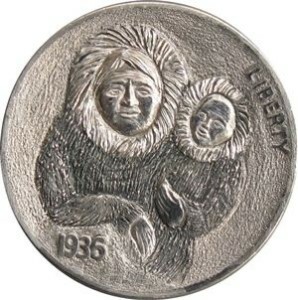 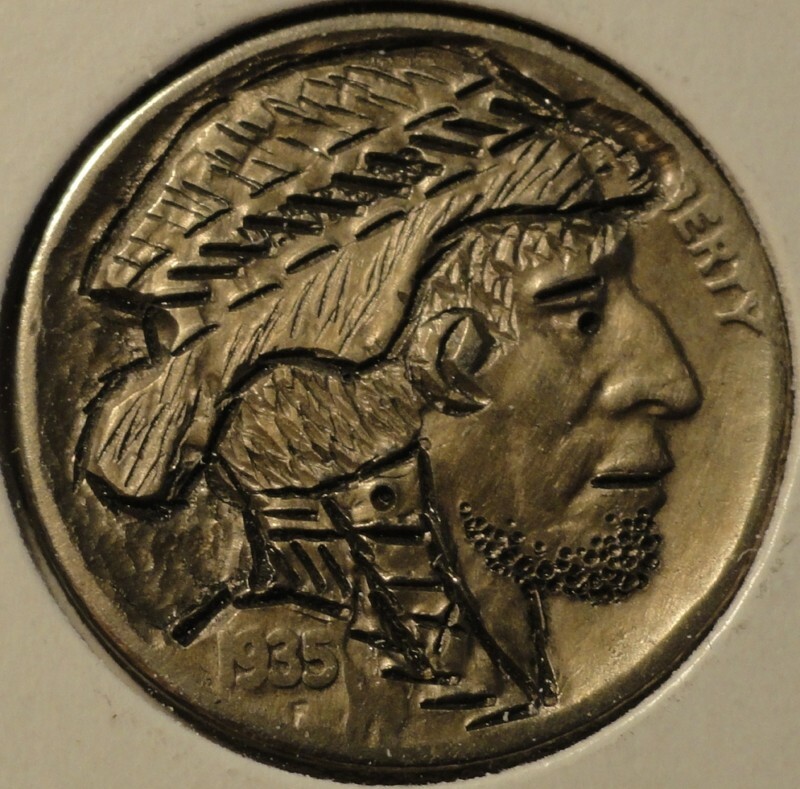 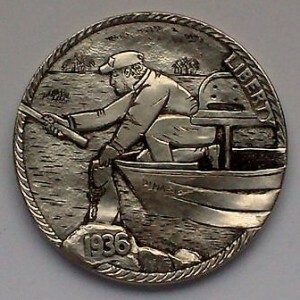 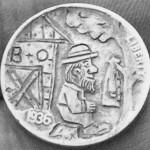 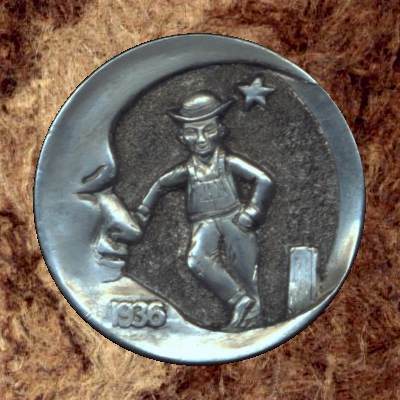 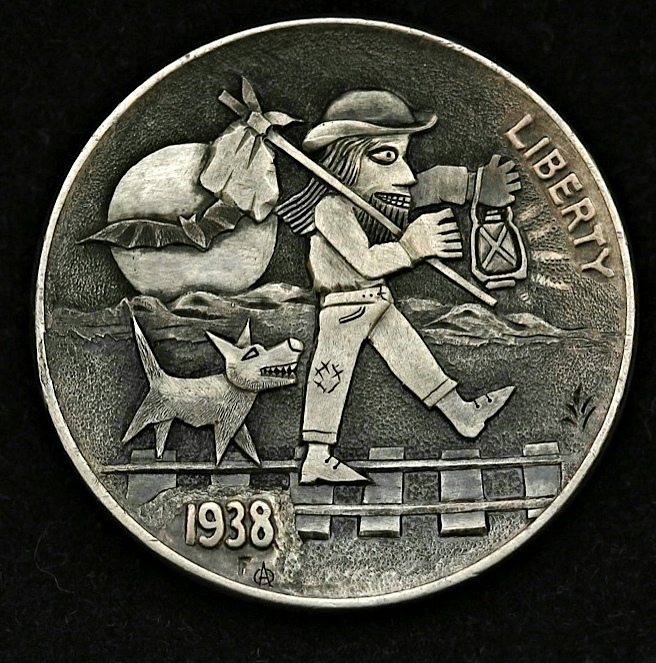 Ron Landis is credited with being the grandfather of the “modern” hobo nickel movement. Within a few years, many more modern carvers sprung up. 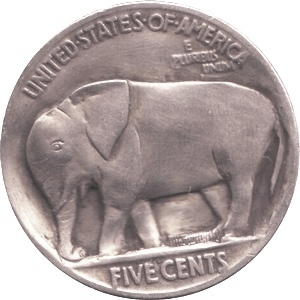 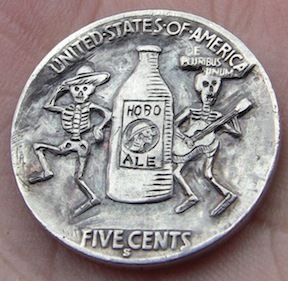 The difference between hobo nickels and love tokens is that hobo nickels are sculptural and raised while love tokens are flat with designs carved below the surface of the coin. 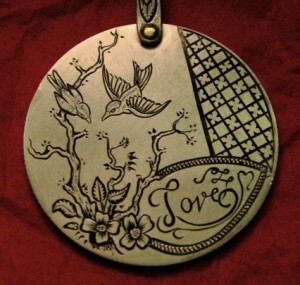 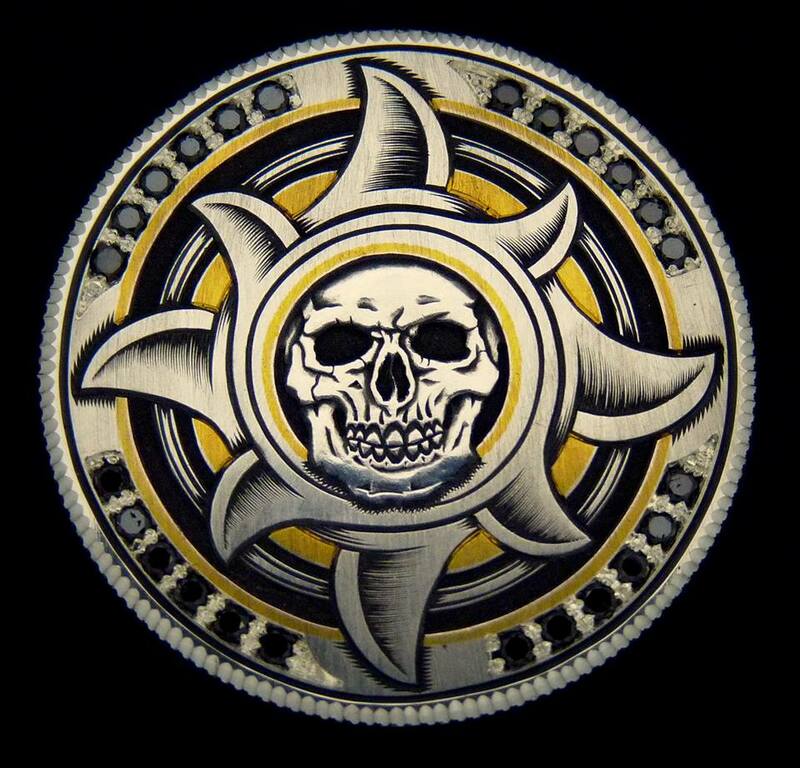 Love token art is quite similar to scrimshaw art, except the metal is denser and harder to carve. 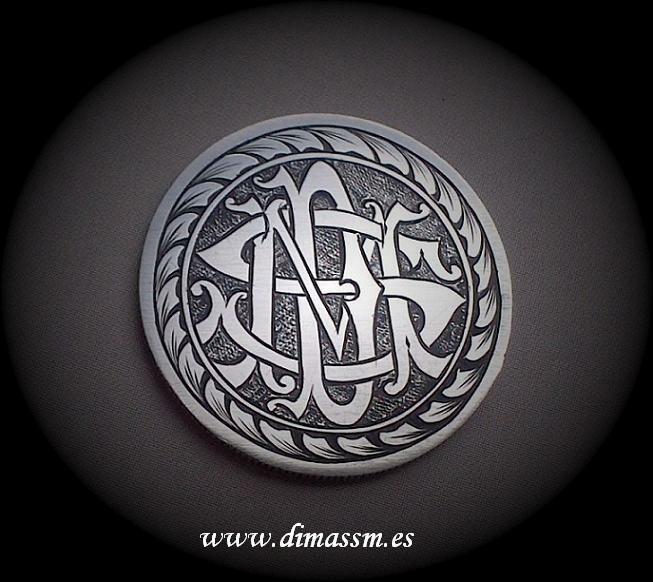 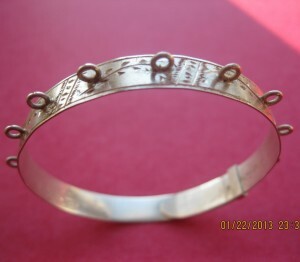 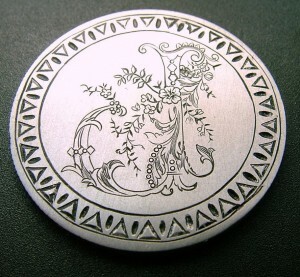 Also metal engraving uses a variety of line and angles. 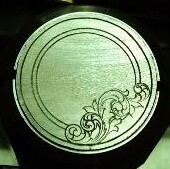 The angles create bevels in the metal and shinny diamond cut looking lines. 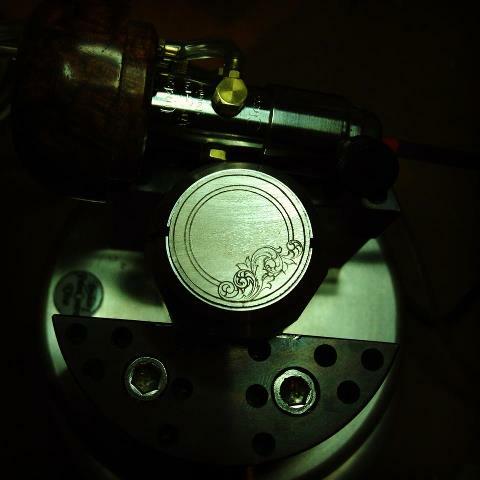 In scrimshaw, the line is just a trench and filled with ink. 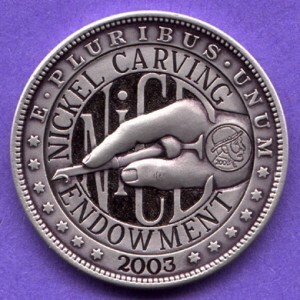 With the new market established, master engravers as well as one scrimshaw artist began making hobo nickels. 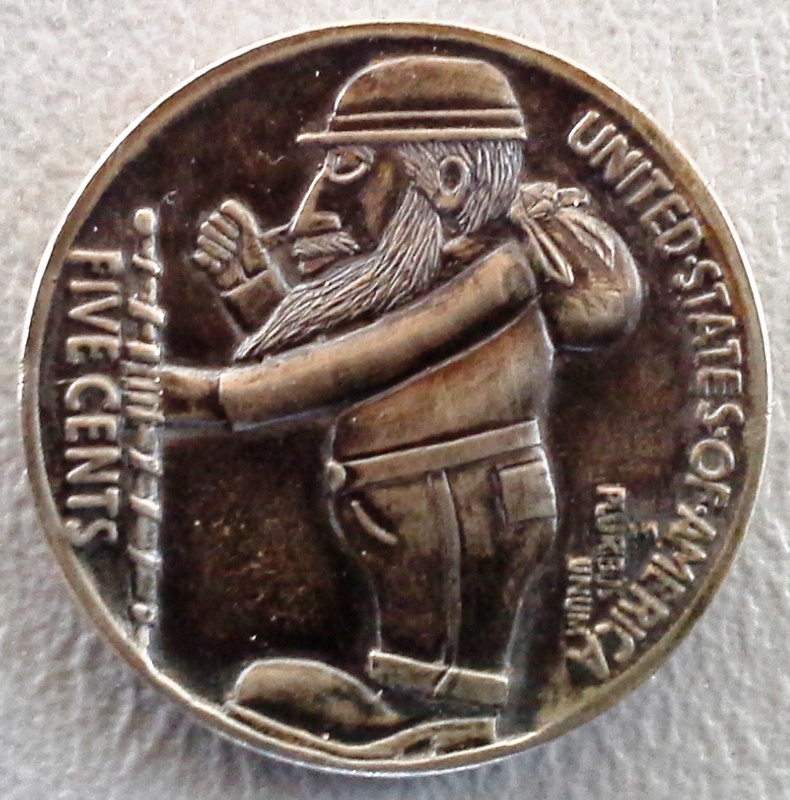 What that means for love tokens is that many of these new hobo nickels have more engraverly effects combined with the sculpting. They are a bridge between the two worlds. 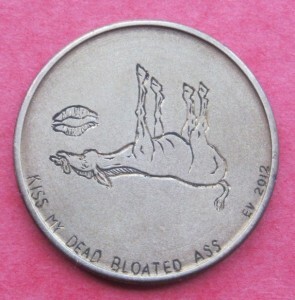 Sometimes they loose all their relief and are just engraved coins. 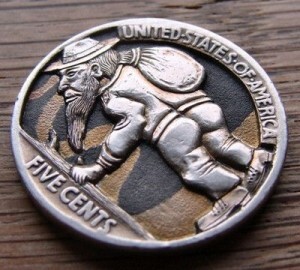 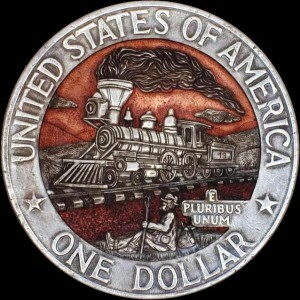 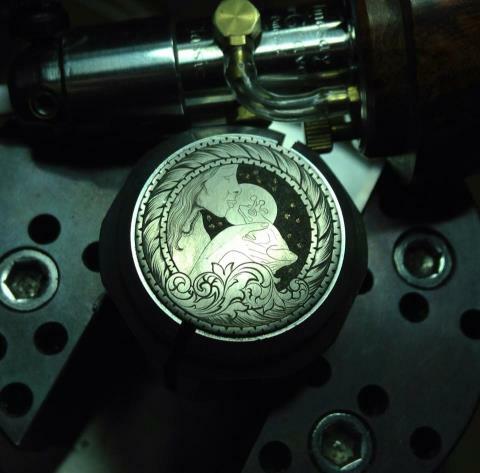 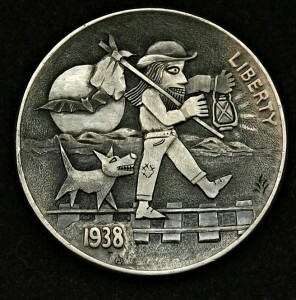 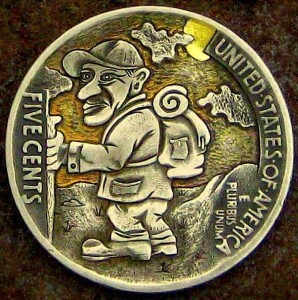 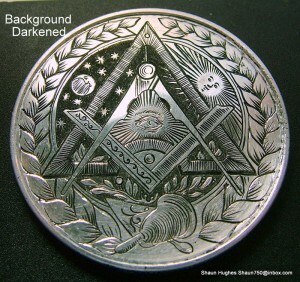 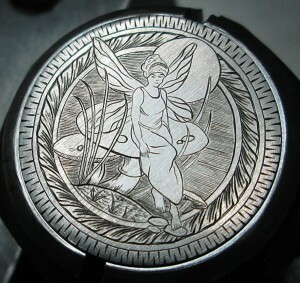 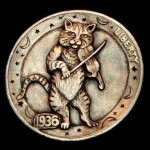 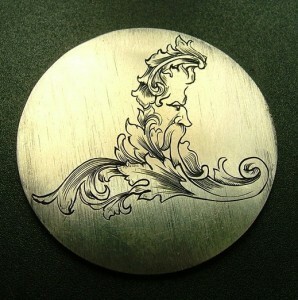 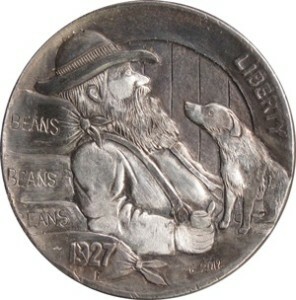 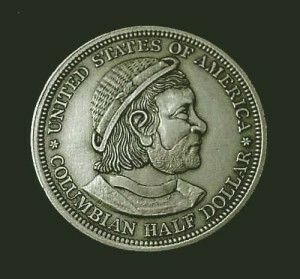 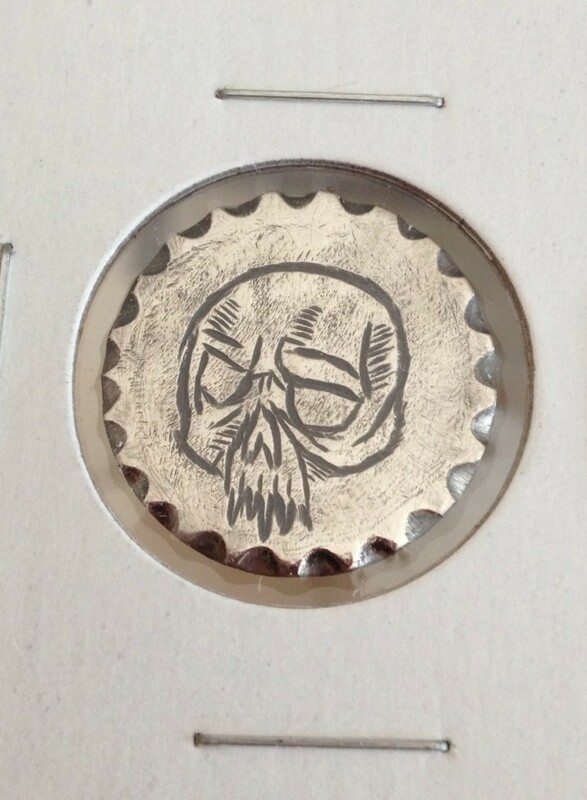 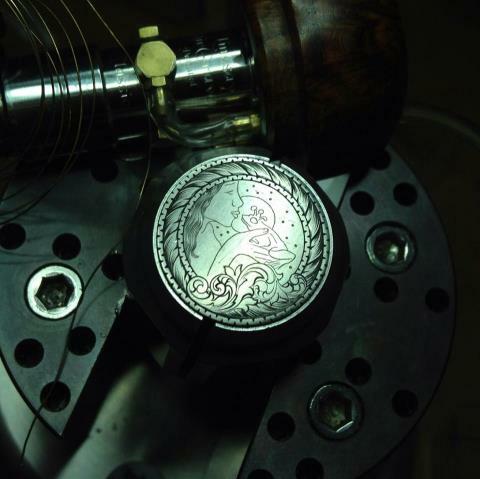 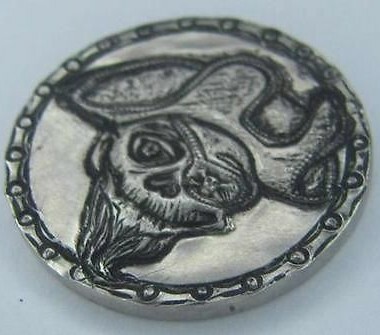 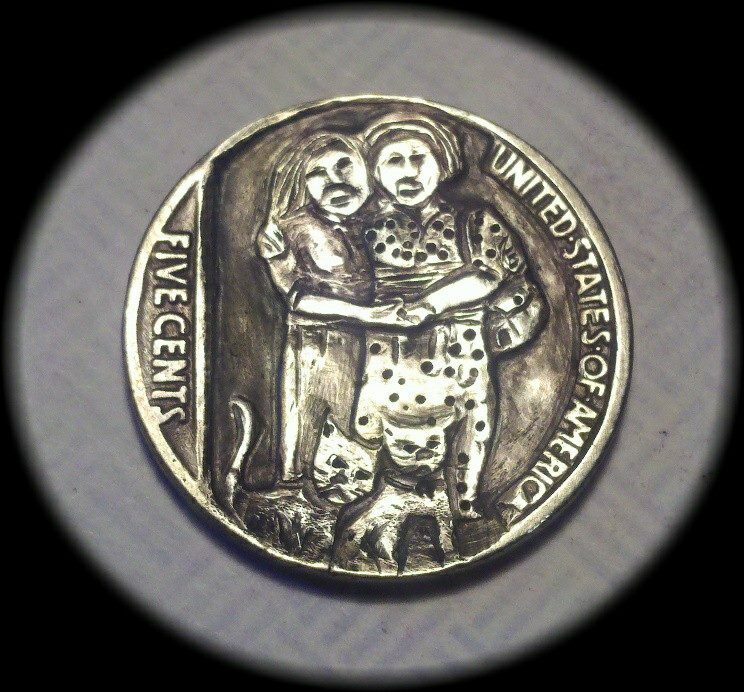 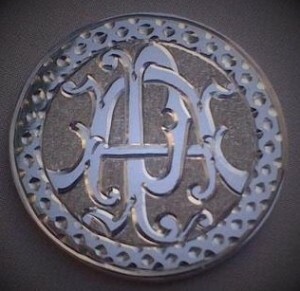 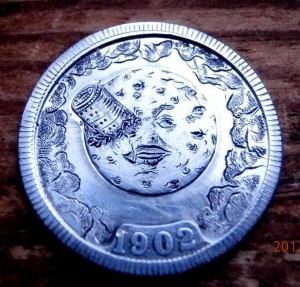 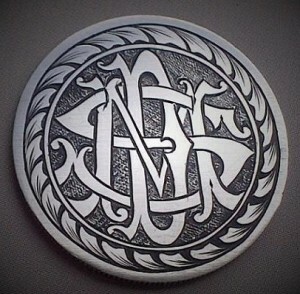 Andy Gonzales, a master engraver, started out making hobo nickels in his down time from his regular engraving orders. 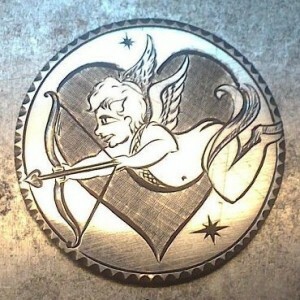 Recently he has been transitioning into making more love tokens and listing them for sale as such. 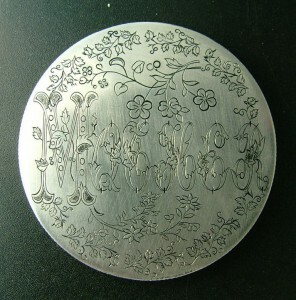 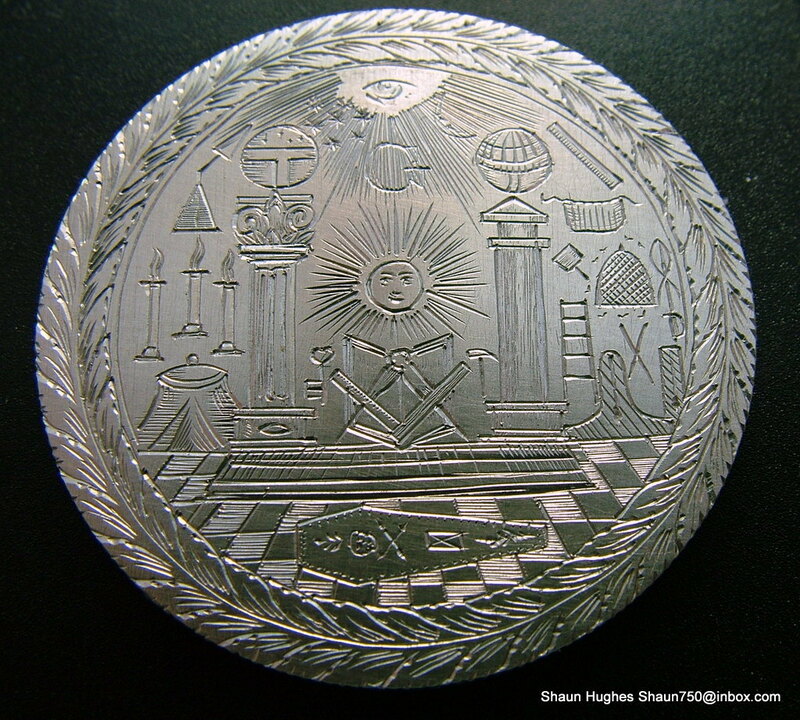 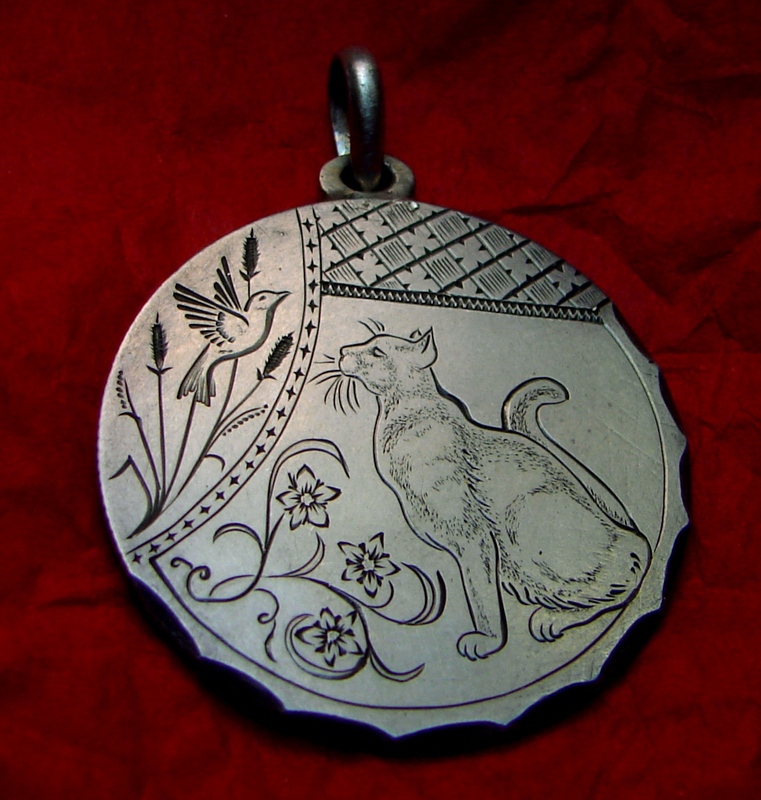 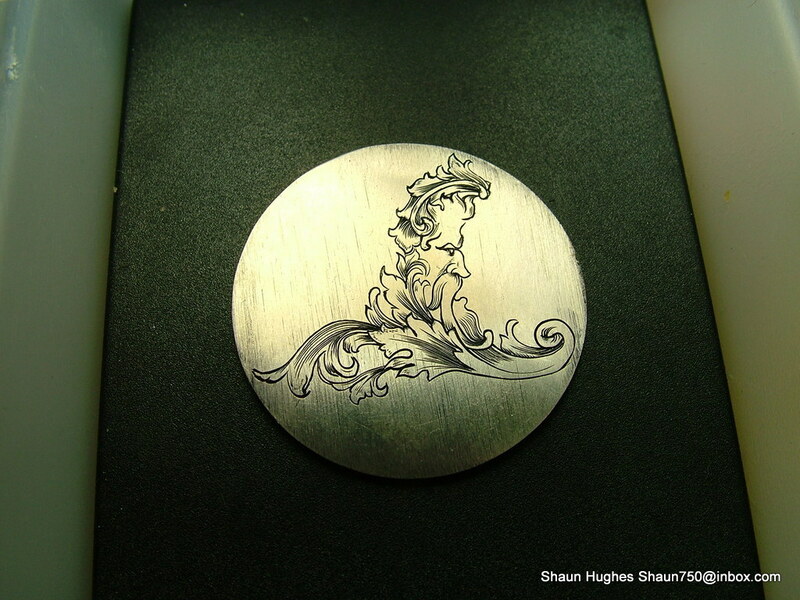 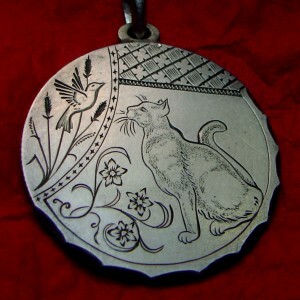 The love token is more in line with his engraving training. 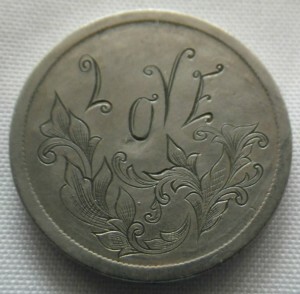 Gonzales may become the pioneer for a modern love token movement. 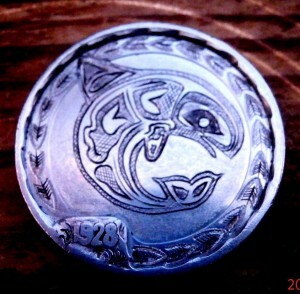 NOTE: * J Press started carving in the late 1970’s but is best linked to the later group of carvers from the 1980’s. 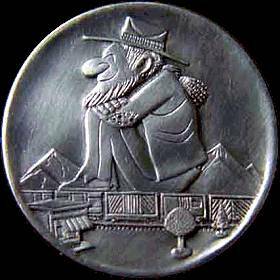 His carvings overlapped between the Classic period (1913-1980) and the Neo-Bo period, also termed Early Modern (1980’s carvers). 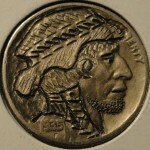 Washington quarter. Pictorial on a 1944 walking liberty half dollar. 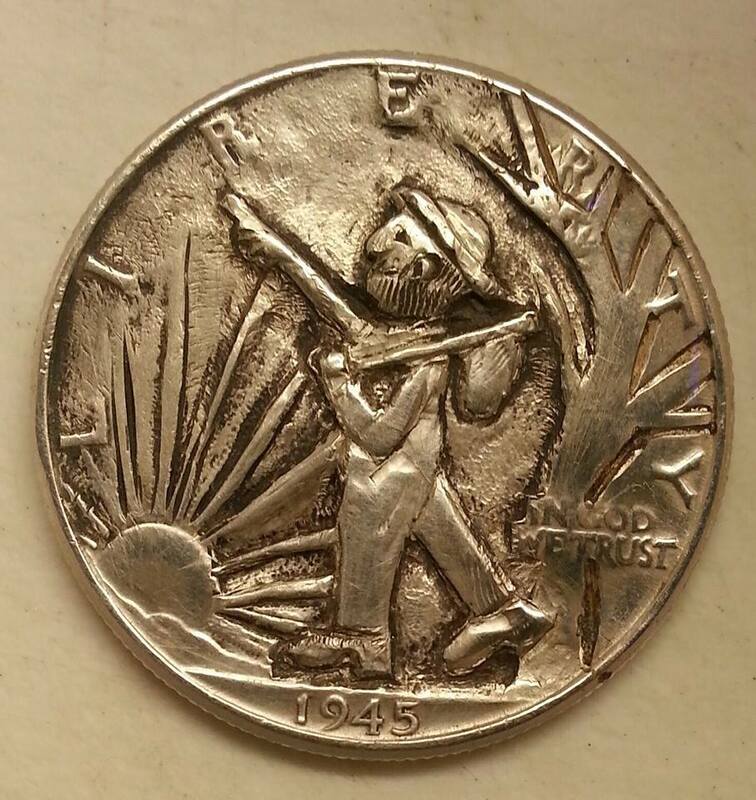 1941 Walking liberty half dollar. 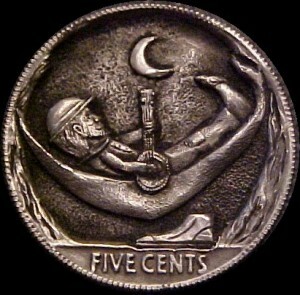 1943 Half dollar. 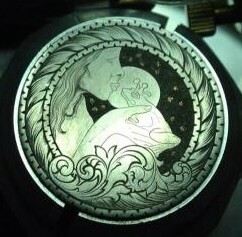 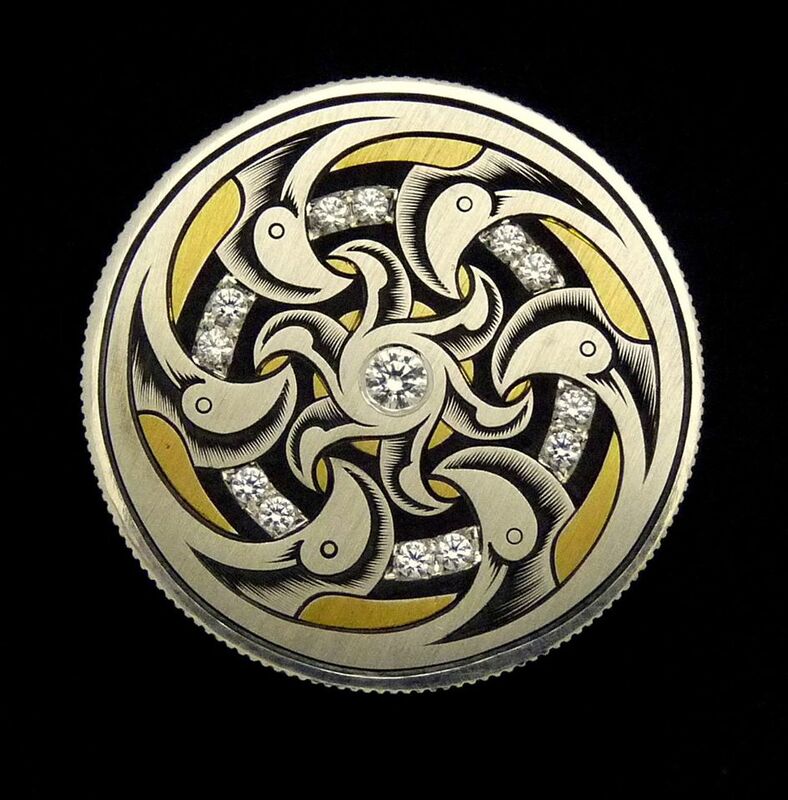 Half dollar with 24K gold inlay. 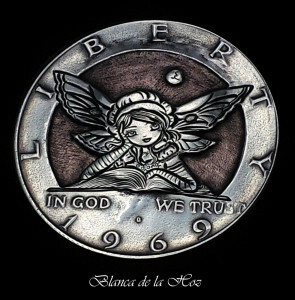 Walking Liberty half dollar. 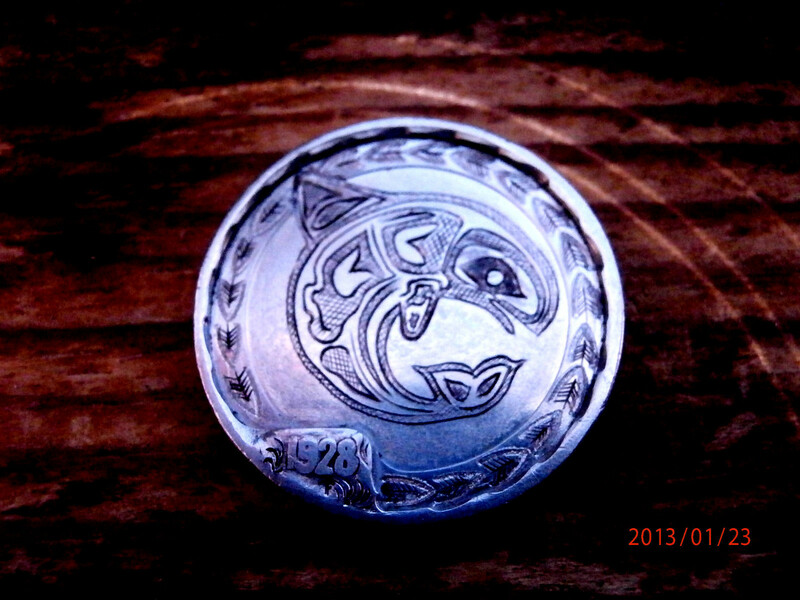 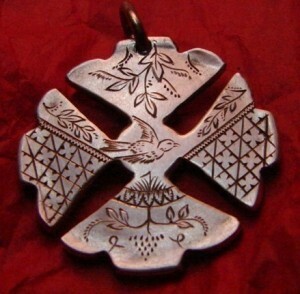 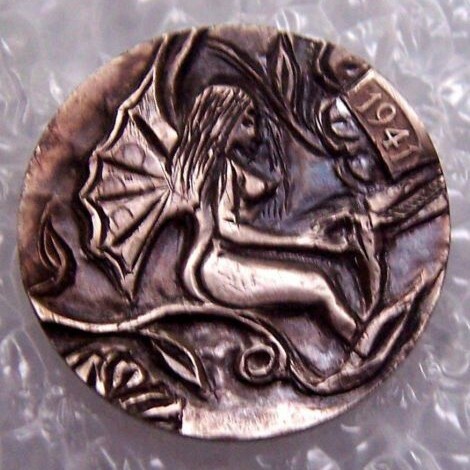 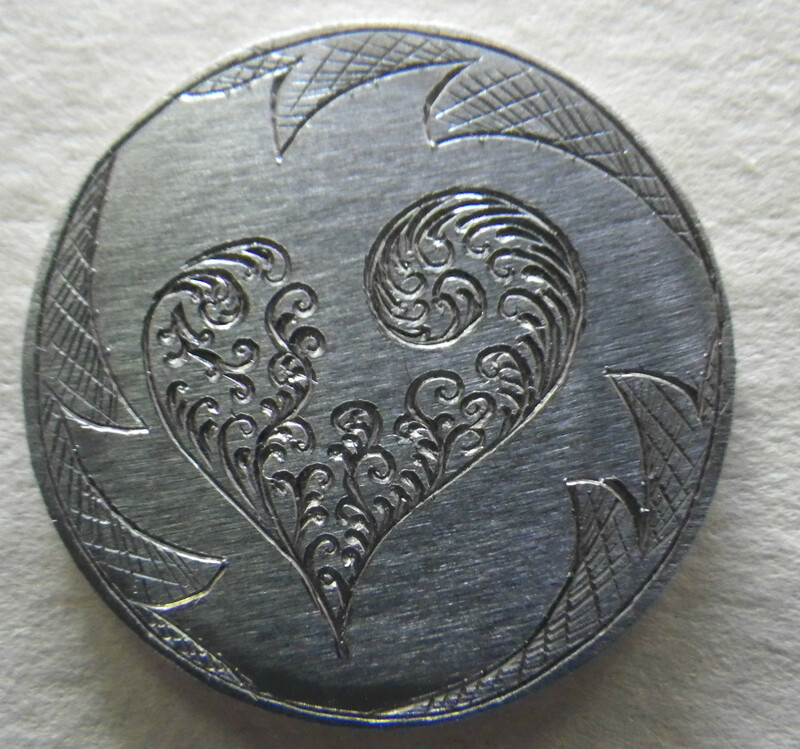 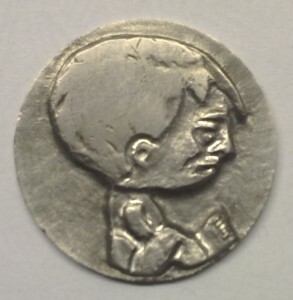 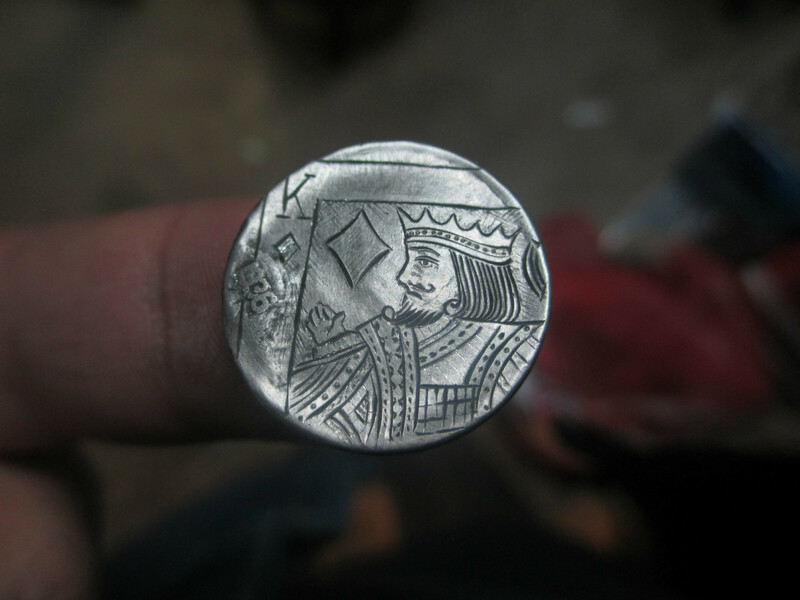 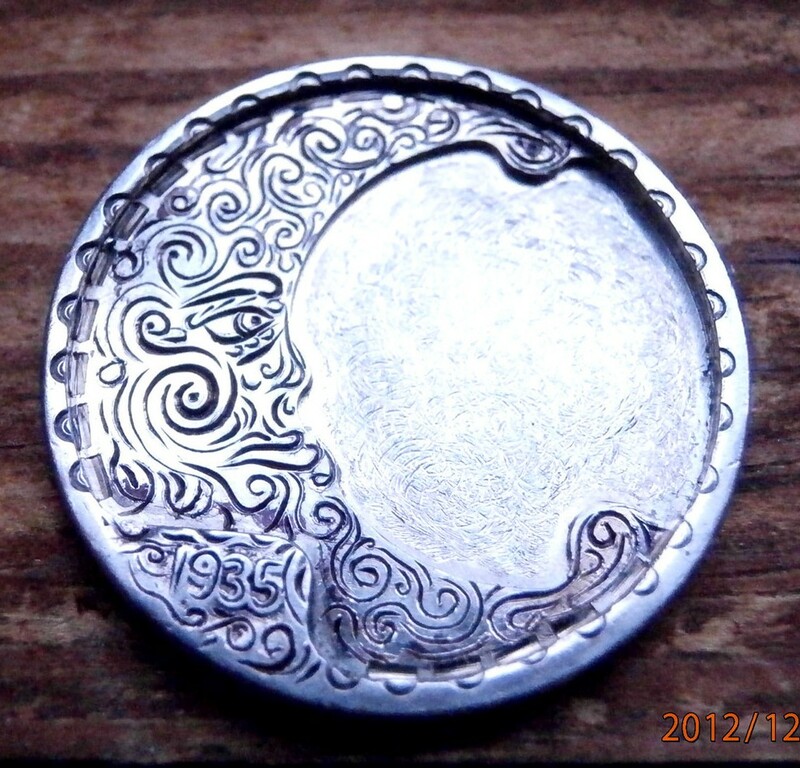 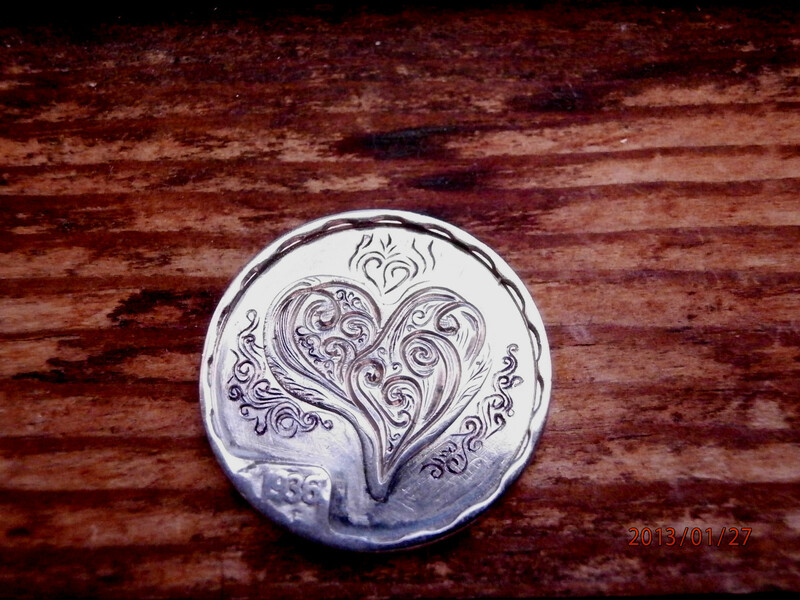 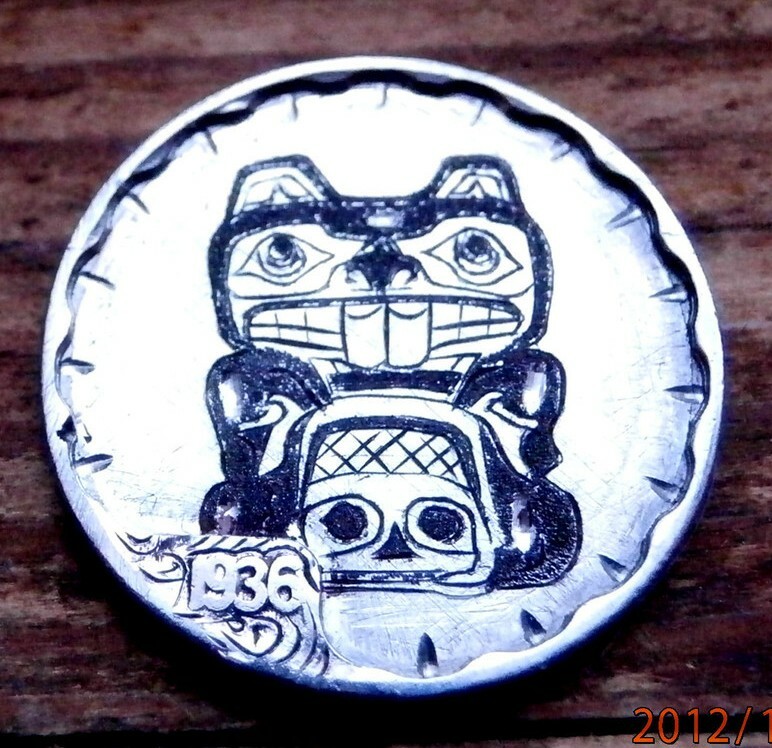 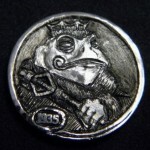 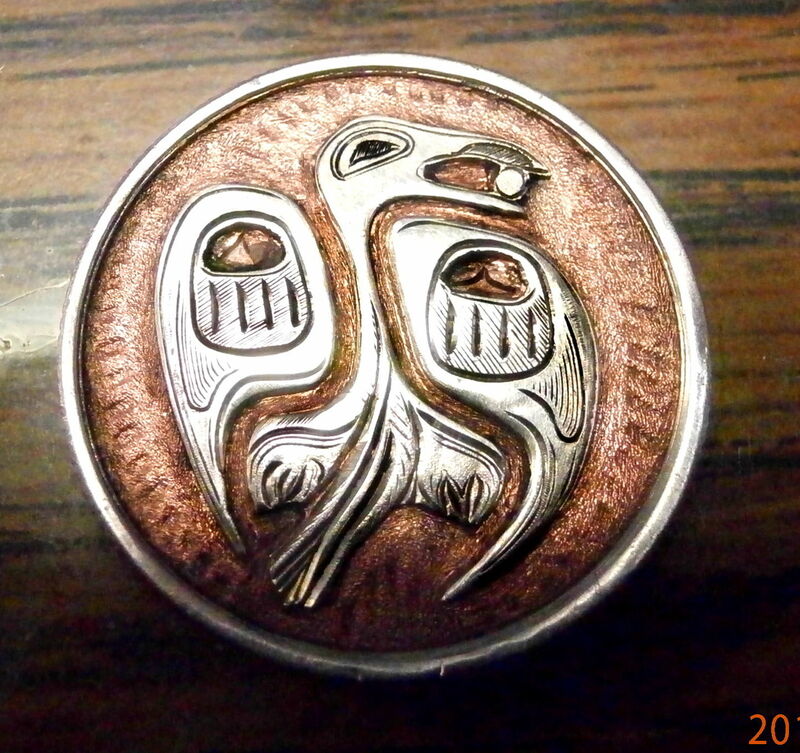 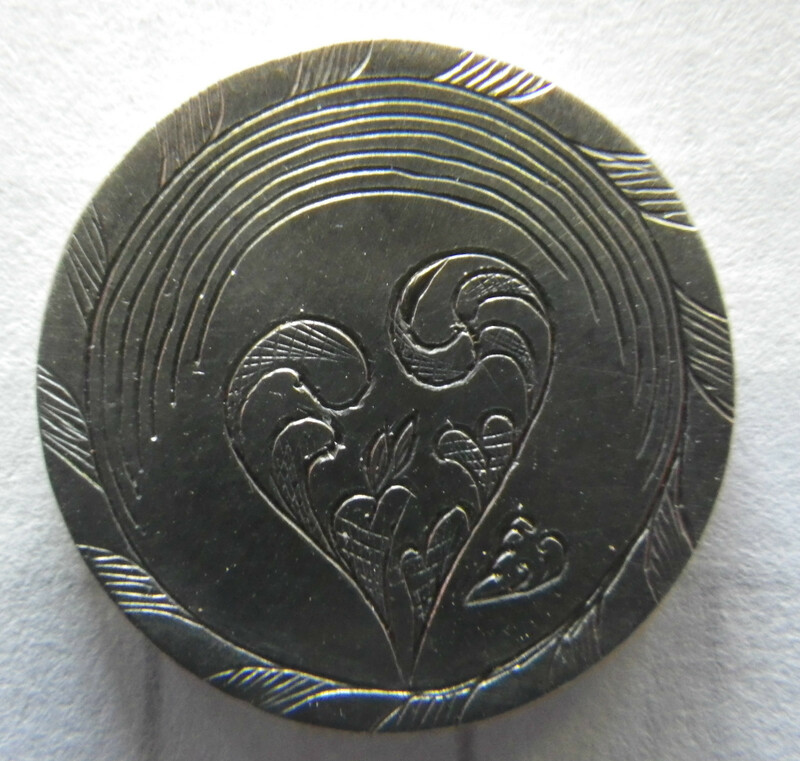 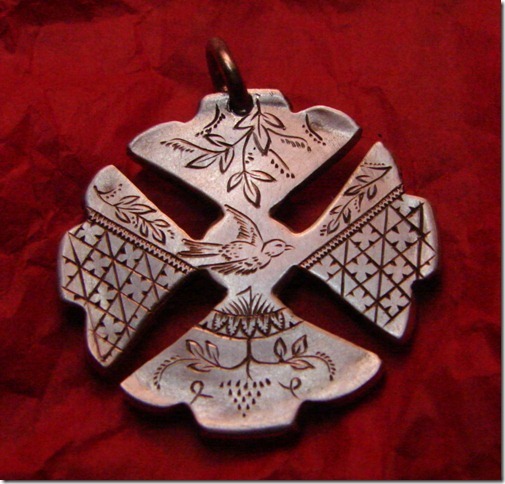 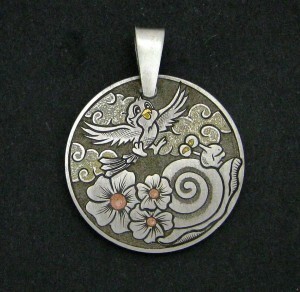 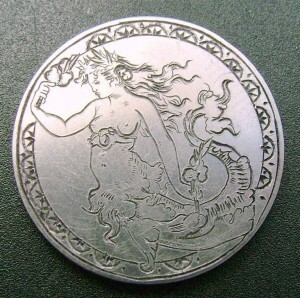 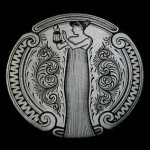 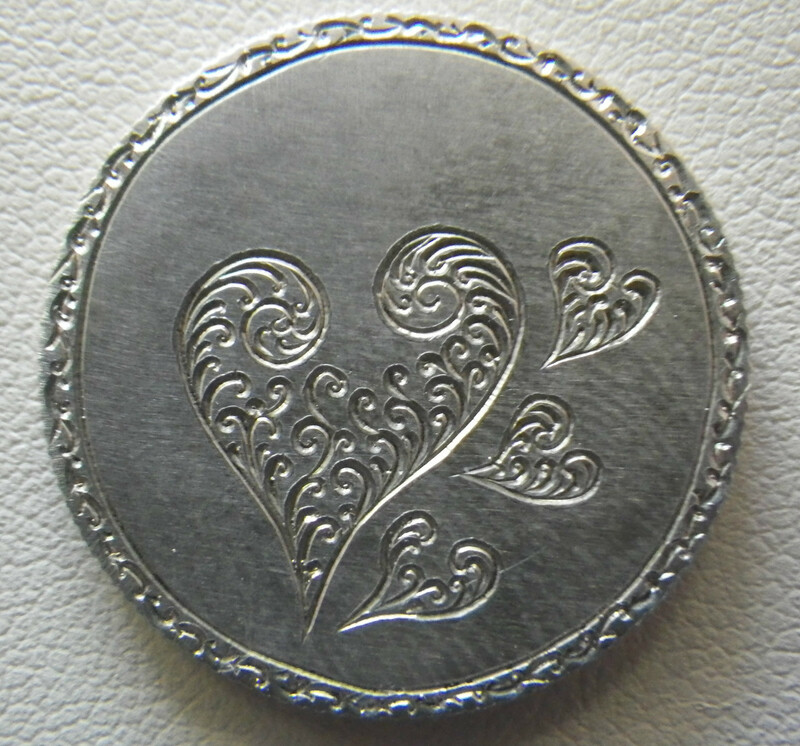 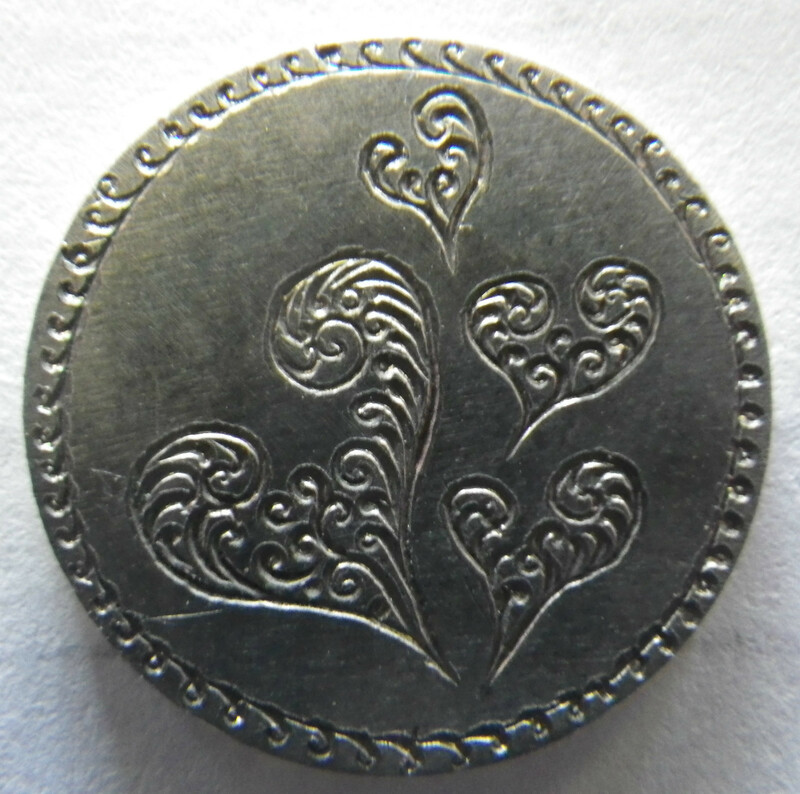 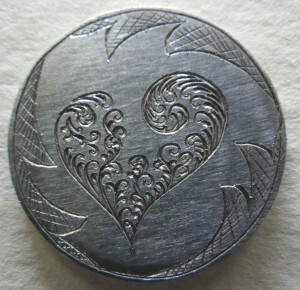 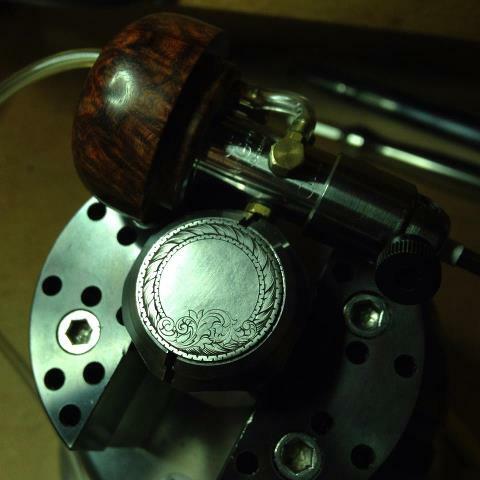 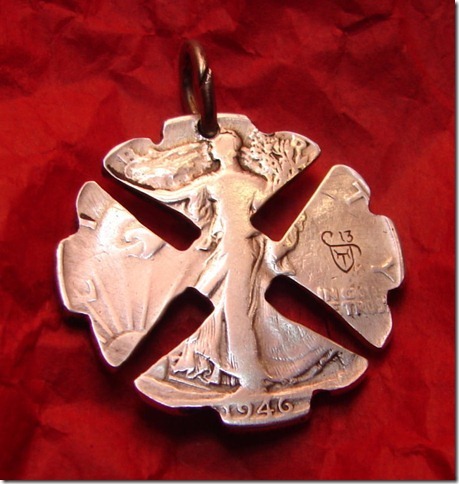 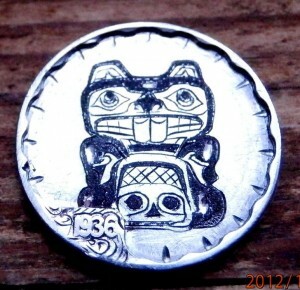 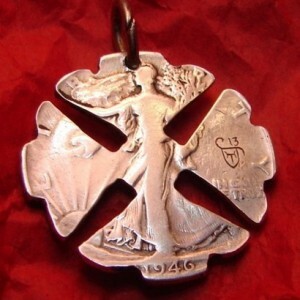 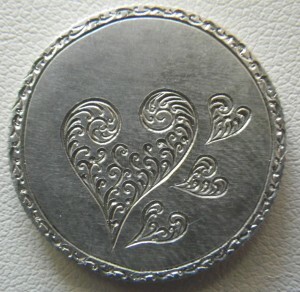 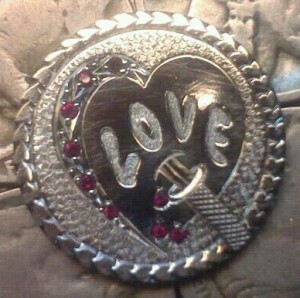 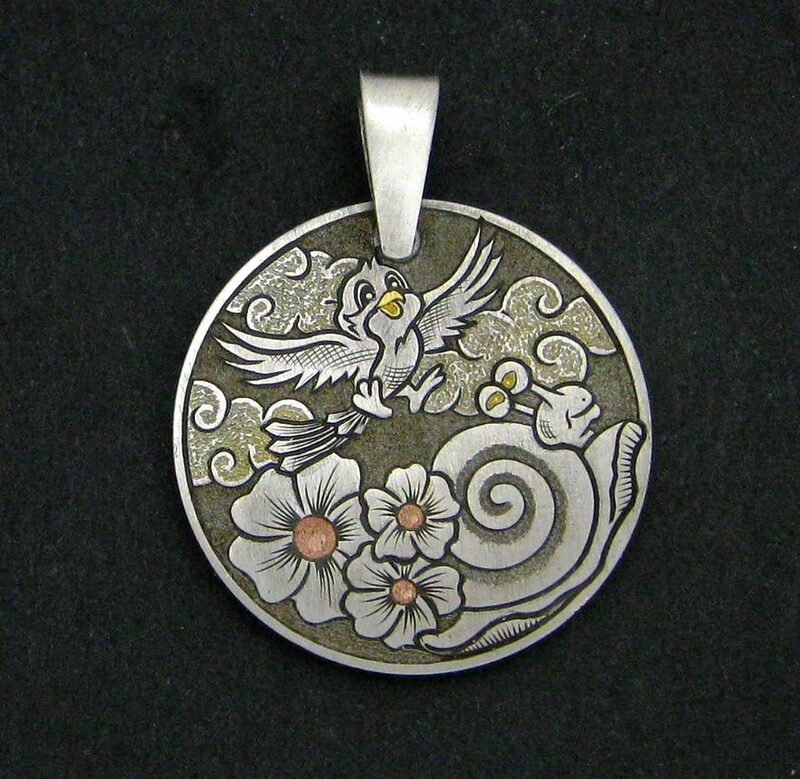 Hobo nickel carver now branching out into love tokens. 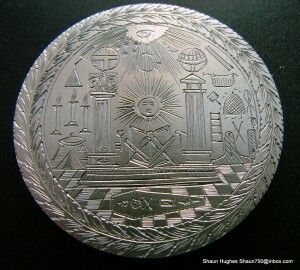 Extremely ornate and intricate, note that gold was inlaid in the stars. 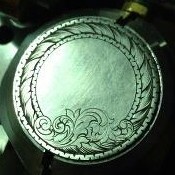 Step 1, Outlining the border. 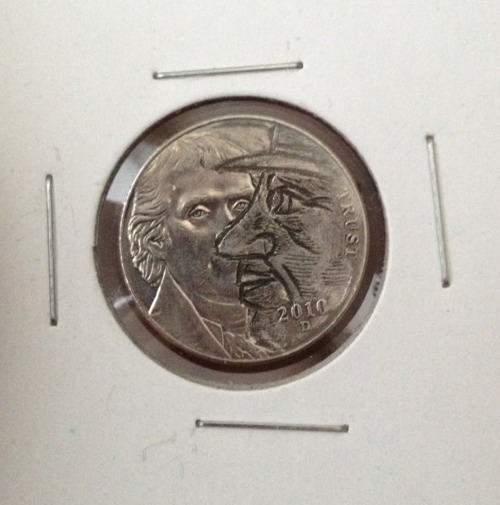 Note: What looks like notches out of the coin at left and right is the vise that holds the coin. 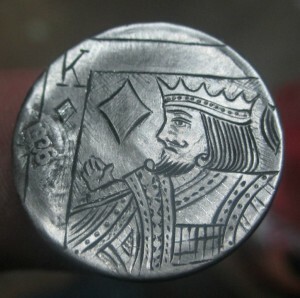 Step 3, Outlining the subject. 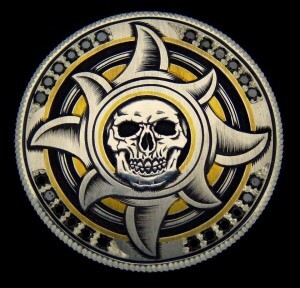 Step 4, Adding gold stars and darkening the background. 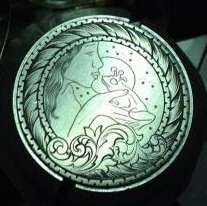 Step 5 above, Subject detail. 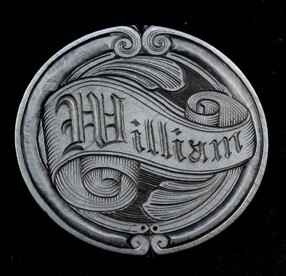 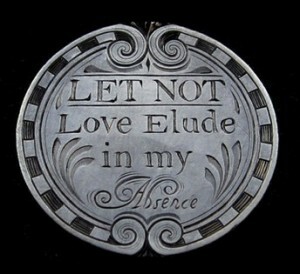 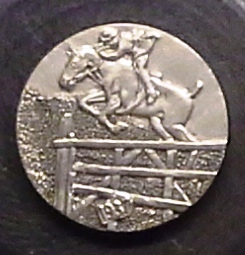 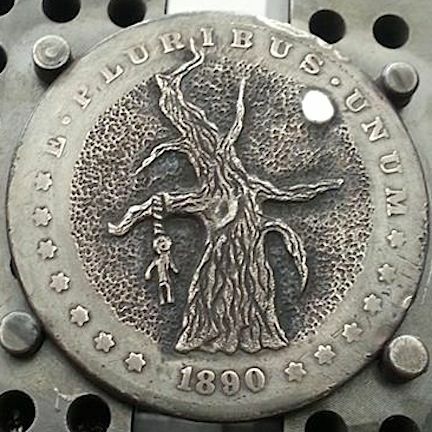 engraved on a nickel. 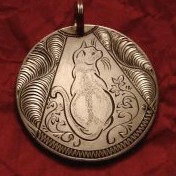 Made for charity auction. nickel composition. 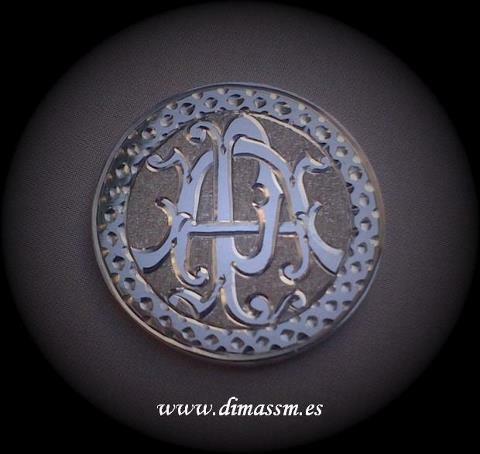 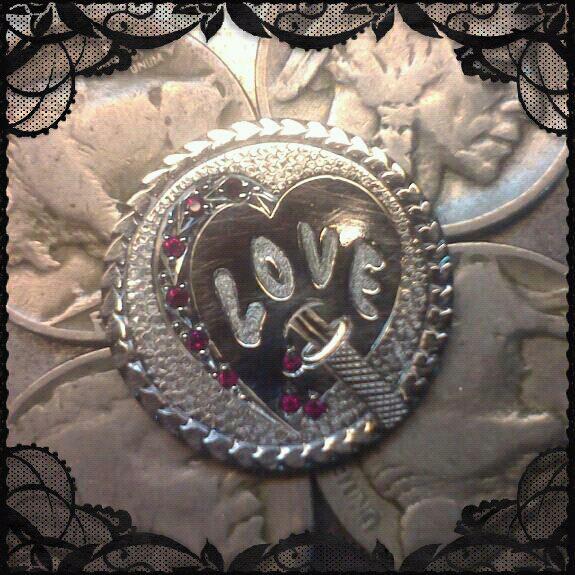 Initials: P A Initials: D S M Jeweled love token. 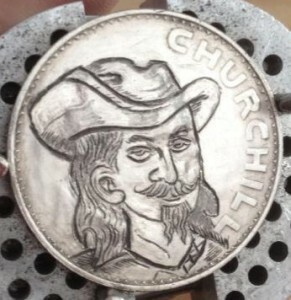 Great Britain Churchill crown. 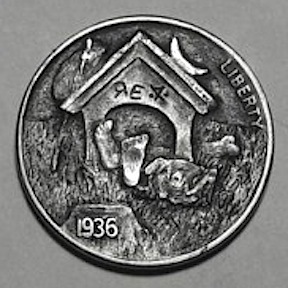 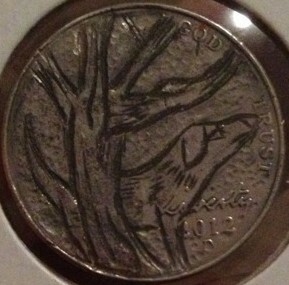 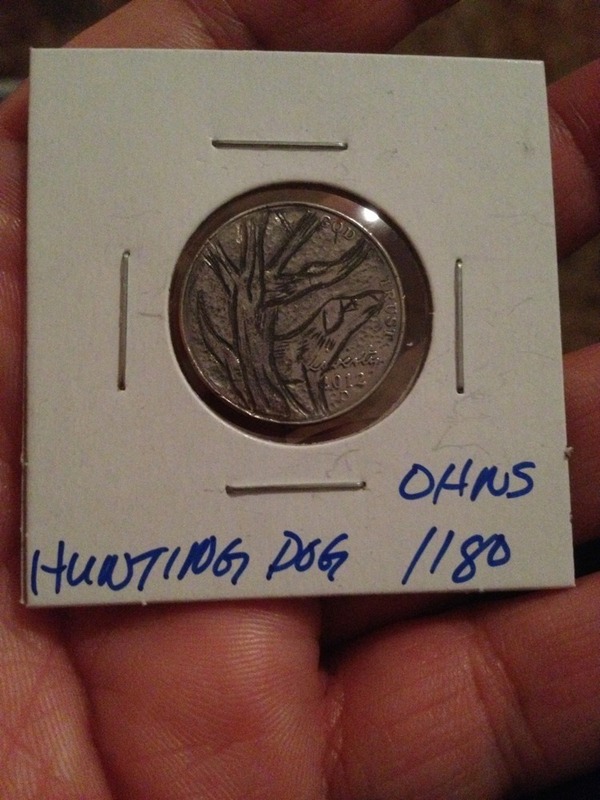 Hunting dog on nickel. 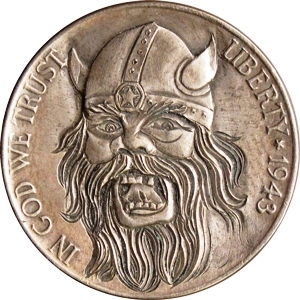 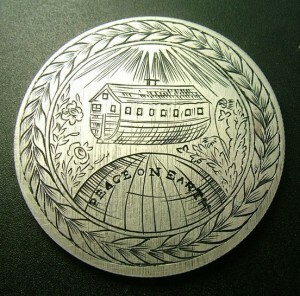 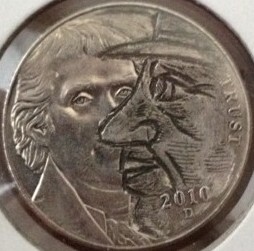 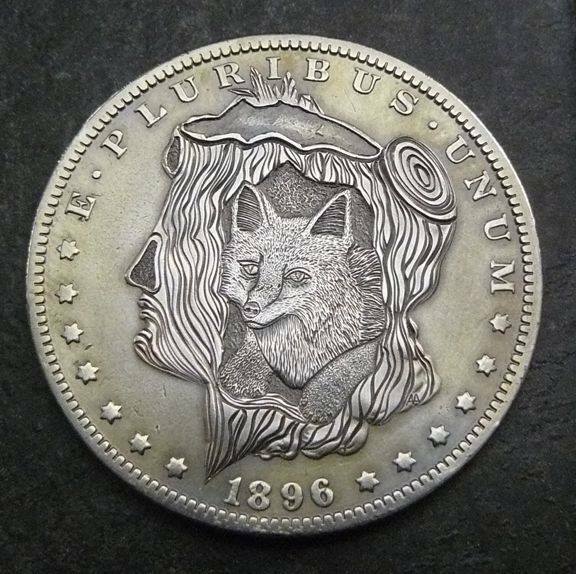 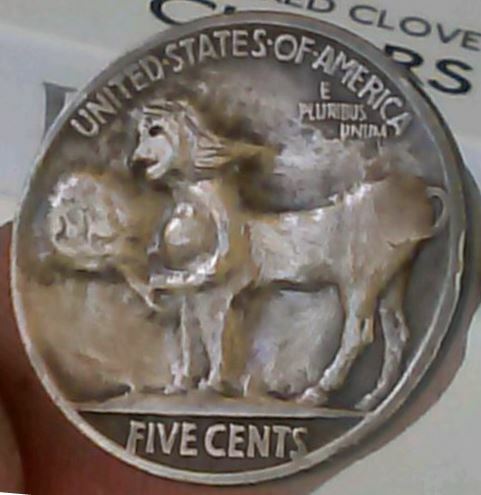 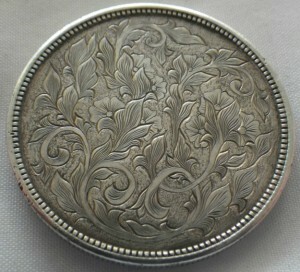 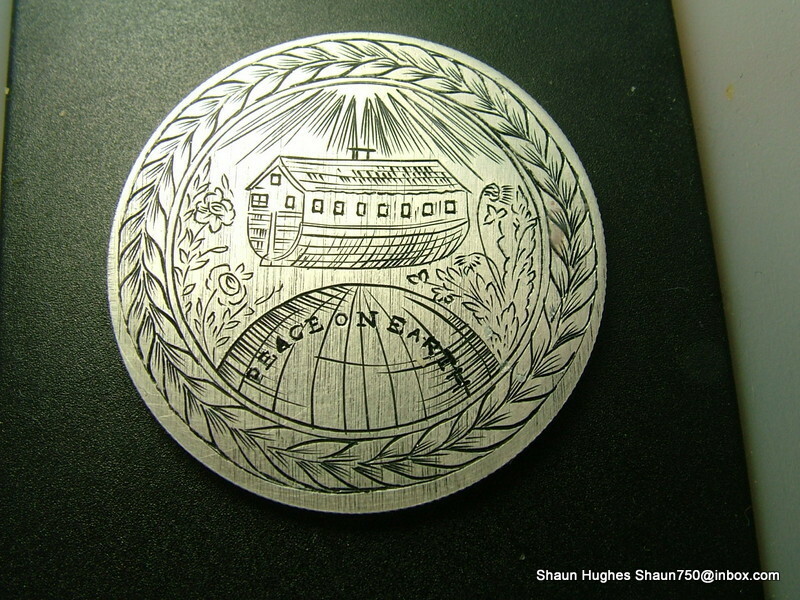 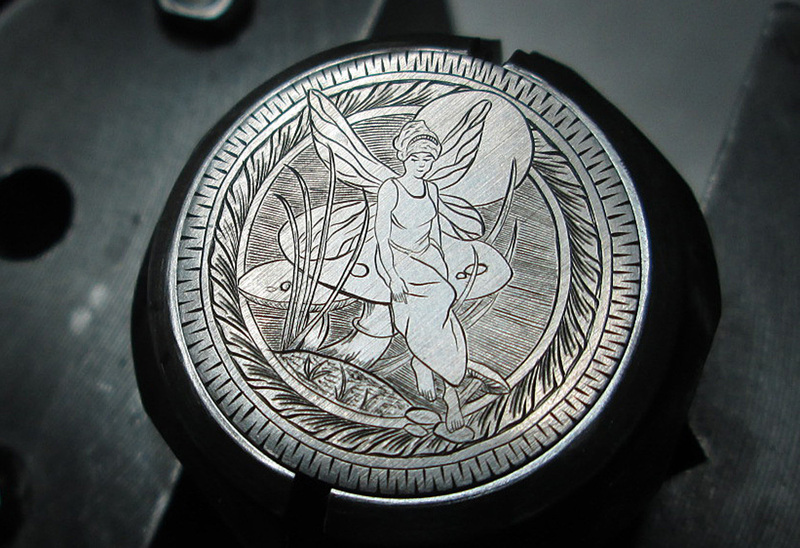 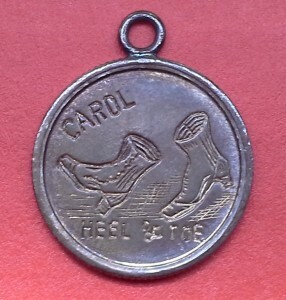 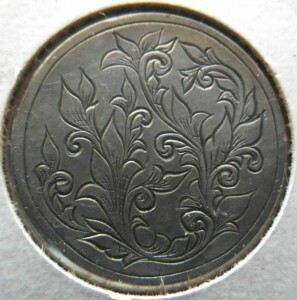 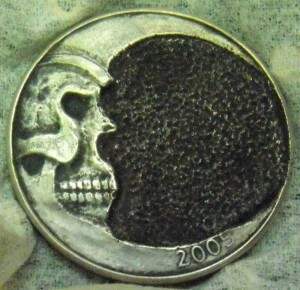 “Twofaced” engraved on nickel. 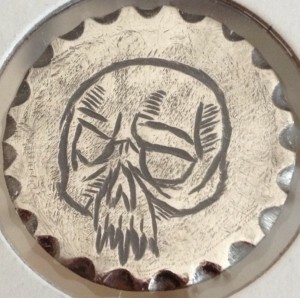 Skull with scolloped border. 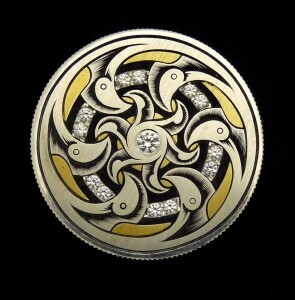 gold inlay and black diamonds. 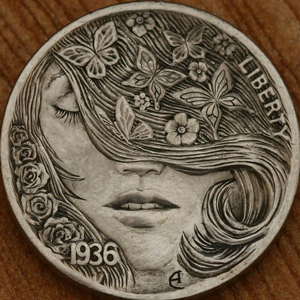 By Ralph Perrico By Ray Cover Jr.